My poor granddaughter has been so patient with the extremely slow progress on the dollhouse. She recently asked me when she could play with it, and I told her I’d make her a dollhouse she can play with right now. She thought a moment and asked, “Would it be as big as me?” “Almost,” I told her. 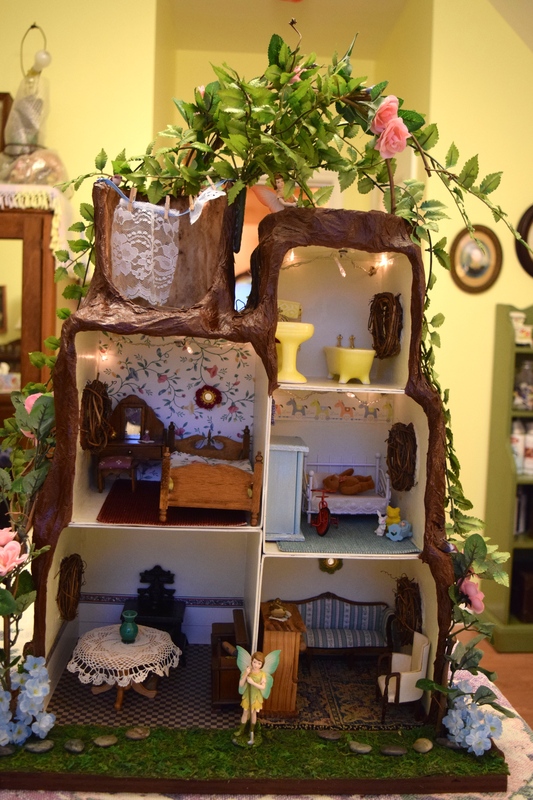 I had already found this idea online for a treehouse dollhouse; I just needed to figure out an easier way to make the tree trunk. And then I found this great tutorial for making tree bark out of tin foil, masking tape and paper towels. The tutorial came from this website, which uses a slightly more traditional version of papier maché. So Mimi’s Cave in Spare Oom once again became a construction zone, this time of the woodland sort. 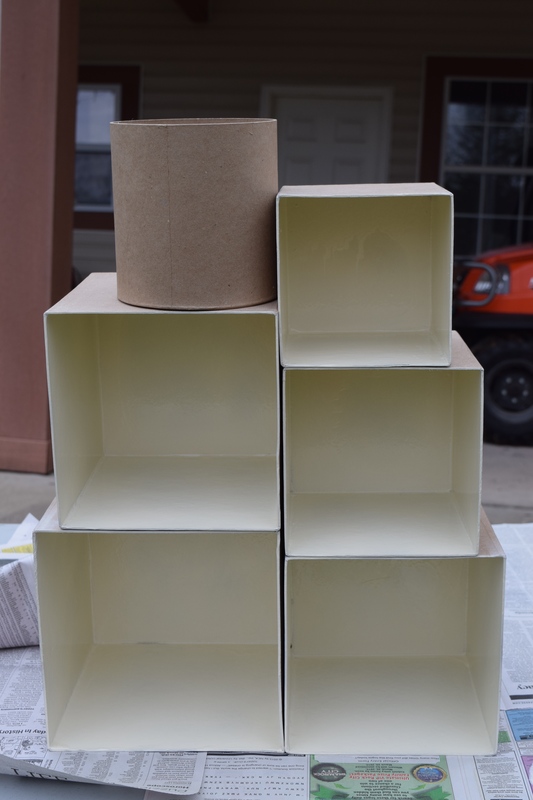 I started with papier maché boxes from Hobby Lobby which I spray painted a warm white inside. 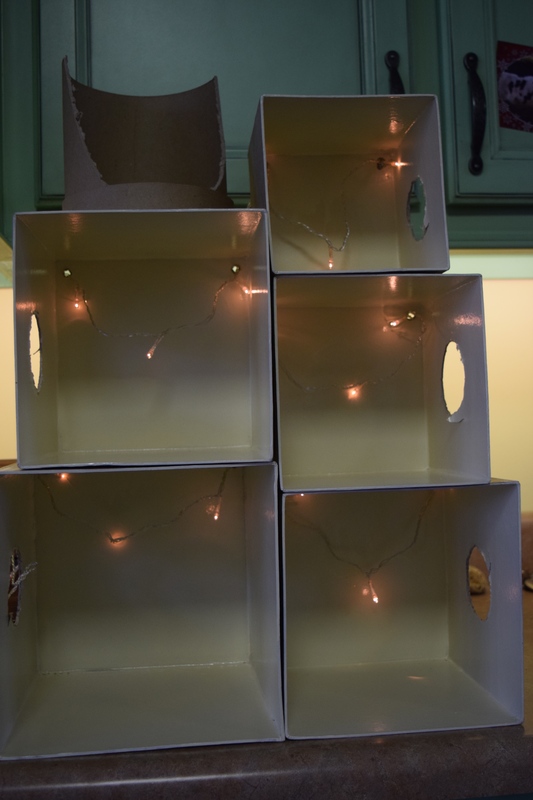 A string of tiny, battery-operated LED lights made a quick, easy way to light the treehouse. I used an ice pick and then a letter opener to poke holes in the back of the treehouse to thread the light string through. Then I cut out a round window for each room. 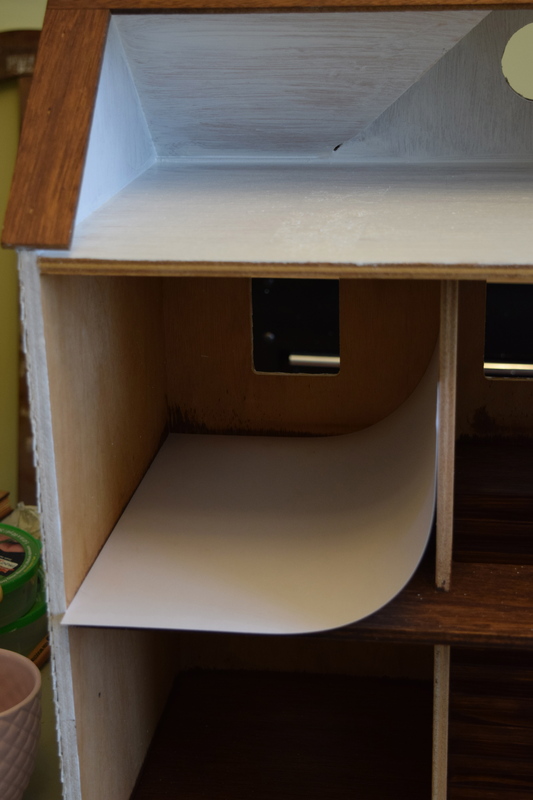 Next I glued the rooms together using a tube of quick dry glue to avoid white glue which would have dampened the papier maché and to provide a stronger, more flexible bond than hot glue. 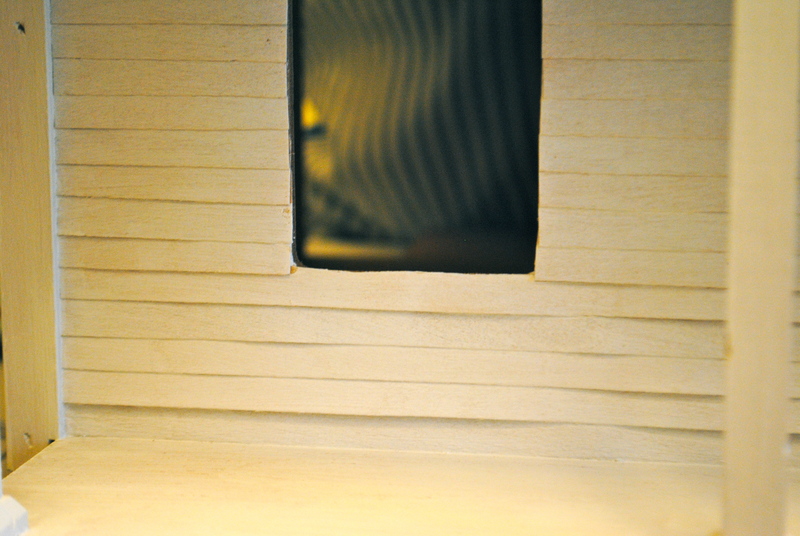 A plywood base provided a stable surface to glue the entire treehouse onto. Once the rooms were glued together, I decorated them–although it would have been easier to reverse the steps. 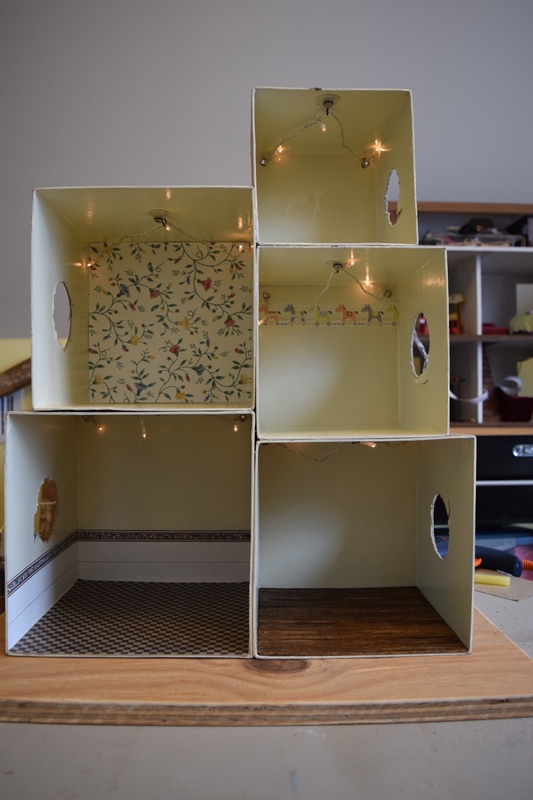 The kitchen floor was made of scrapbooking paper sprayed with a satin acrylic spray, while the living room floor was made of thin craft sticks glued onto a scrapbook paper template and pressed under heavy books until dry. One 300 foot roll of cheap aluminum foil was more than sufficient for the entire project. I crumpled bits to fill in all of the square crevices and to round off all the corners of the boxes to create a more rounded tree. 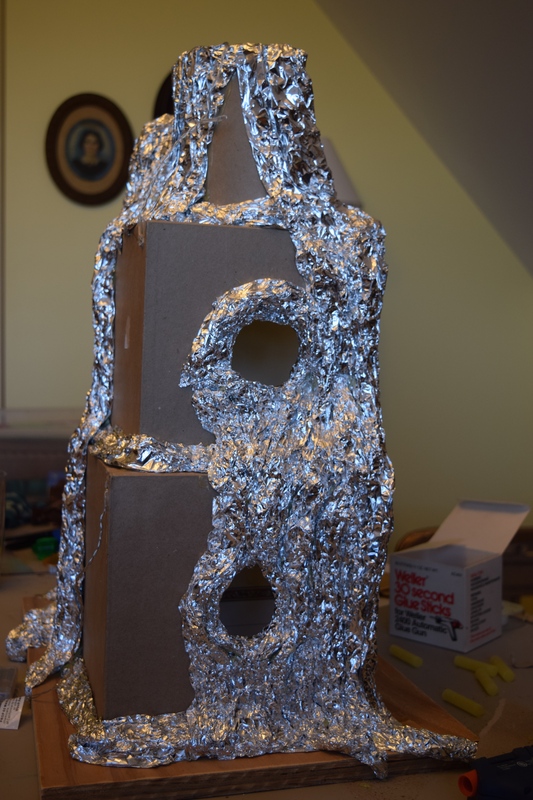 I tore off a sheet of aluminum foil longer than the treehouse was tall, then crumpled it into a long piece, which was then hot-glued to the boxes. 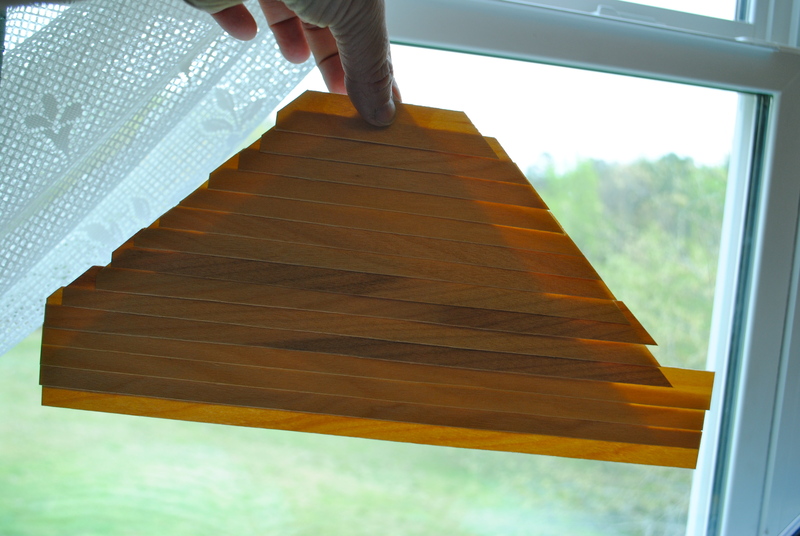 Shorter lengths of foil were easy to glue around the windows and to fill in any gaps between vertical “runs” of bark. 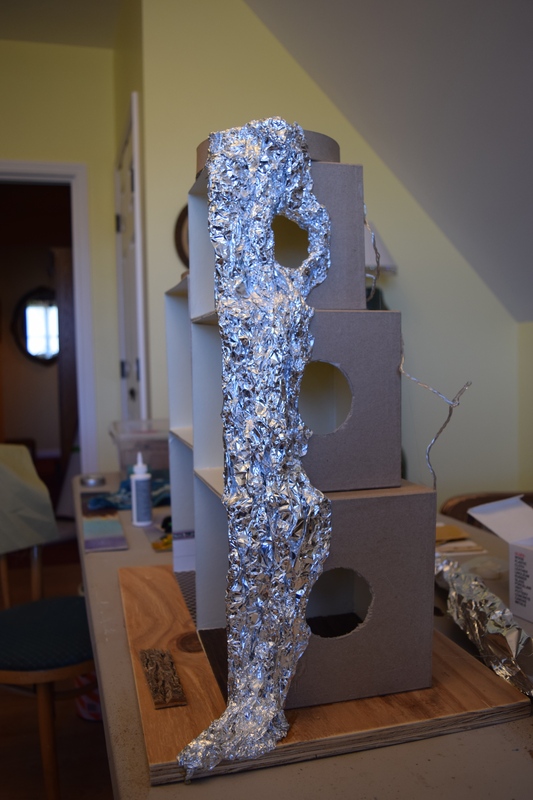 Once the foil bark was glued on, it was time to cover it with masking tape. One large, cheap roll was more than enough. 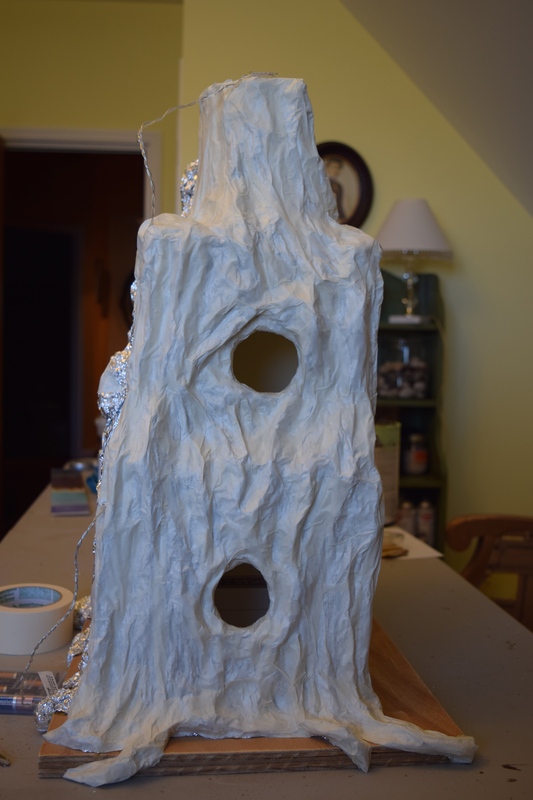 The masking tape needed to cover the foil so that the papier maché would adhere to it. 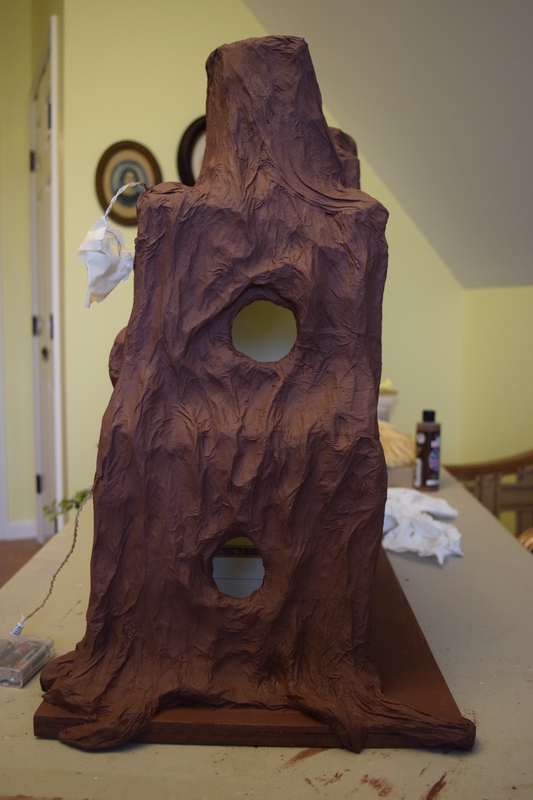 Next, a coat of brown acrylic paint went onto the tree and the base board. One large bottle of paint was more than enough. Bits of white peeked through the brown, but the next step would take care of that. 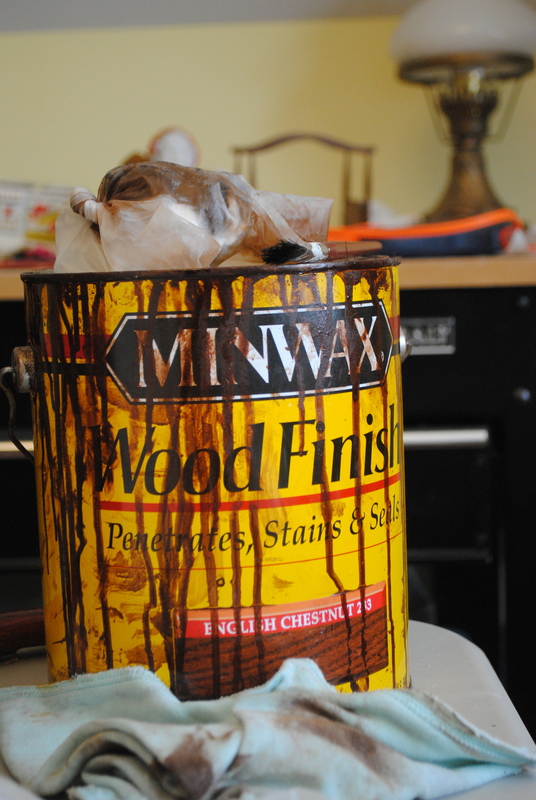 I then brushed dark Minwax stain onto the entire tree. It ran down into the crevices and helped fill in any tiny white gaps that the brown paint didn’t cover. I used paper towels to soak up any excess that pooled at the bottom. 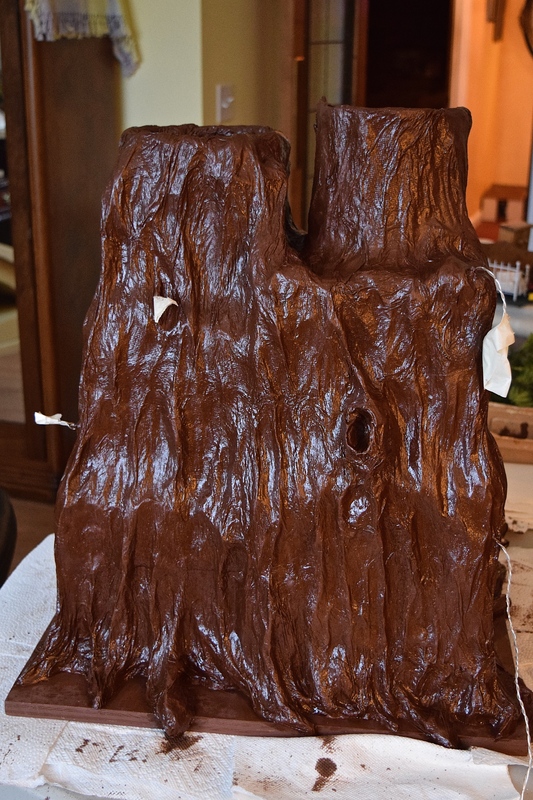 After each side was glazed, I gently dabbed over it with an absorbent rag to remove some of the glaze on the protruding areas, leaving more contrast with the crevices. When everything was dry, I sprayed two coats of matte acrylic sealer over the tree to tone down any shininess left from the Minwax glaze. 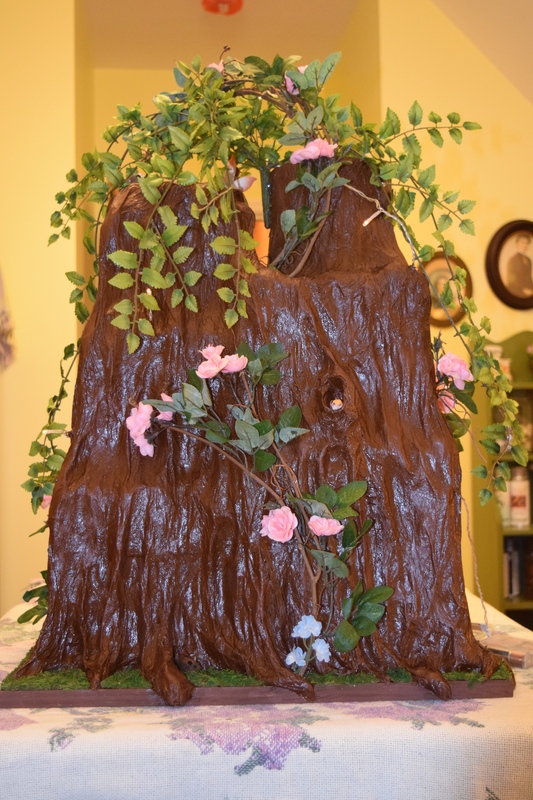 I used Aleene’s extra tacky glue to apply sheet moss around the base of the tree to serve as grass, adding small flat stepping stones. Then I cut apart a grapevine wreath and hot-glued pieces of it to the tree to serve as vines. I cut apart a bouquet of small pink silk roses and wove them into the grapevine. 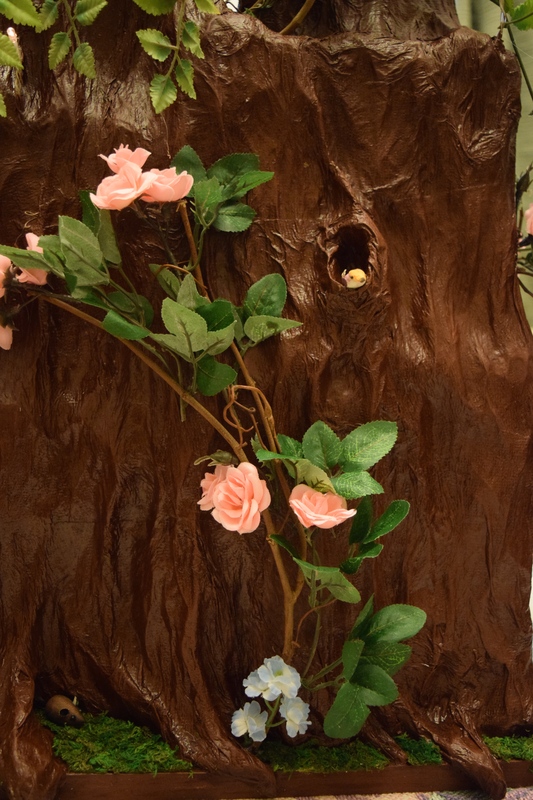 The final touches were bouquets made of small blue silk flowers and tiny mushroom birds glued here and there. A tiny wooden mouse nestled in a hole at the base of the tree. The treehouse was finished and ready for its fairy occupants and their furniture. 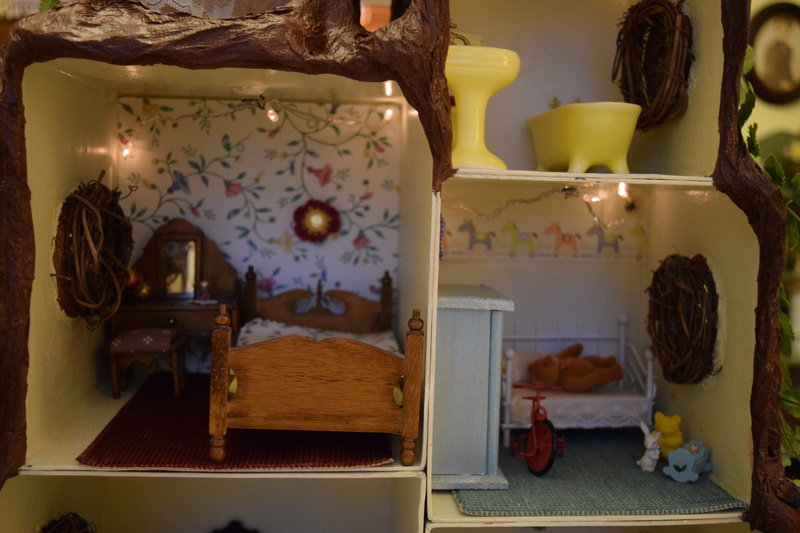 The house was almost completely furnished with extra dollhouse things I’ve collected over the years. 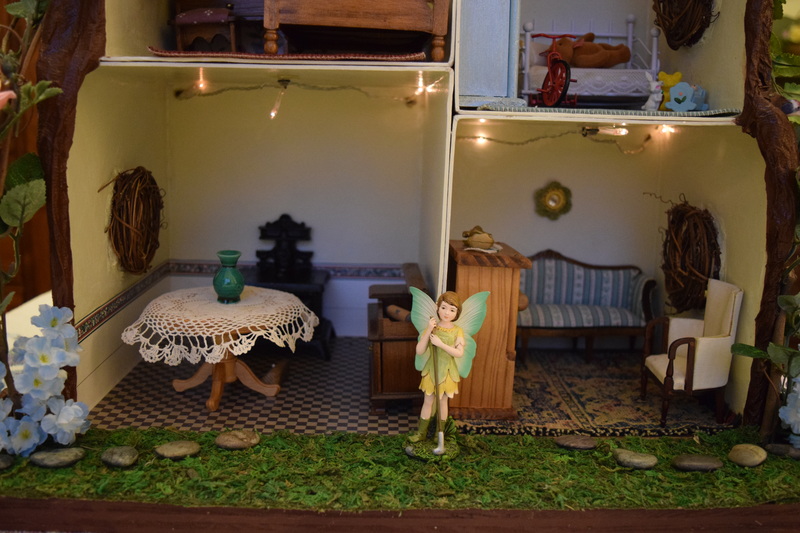 A dainty fairy stands outside the kitchen and living room. You can see the mini grapevine wreaths that serve as interior window frames. Two bedrooms grace the second level, one for the grown-up fairy and one for the little one and her fuzzy bear friend who is taking a nap. 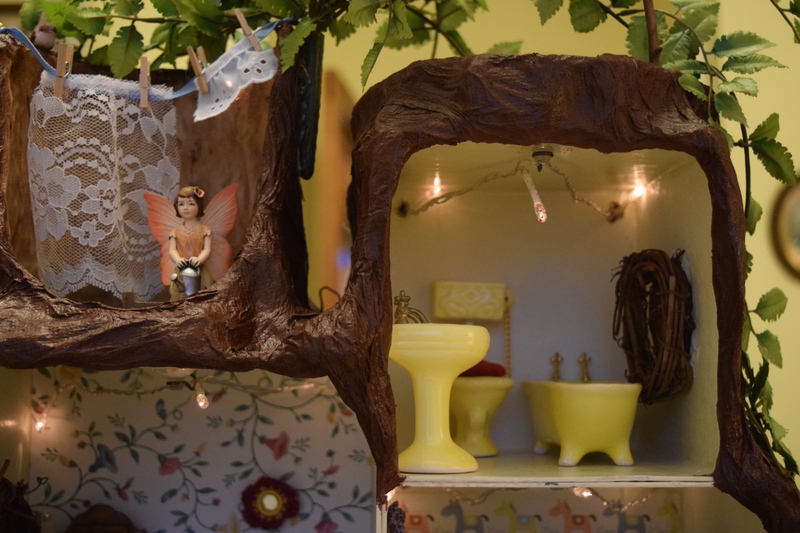 On the top level is a bathroom, which has a rooftop garden on top of it, and an open air laundry room, complete with tiny clothespins to hold the lace curtain the smallest fairy is hanging up to dry. The fairies seemed very happy, but my creation still had to pass the acid test. What would the grandkids think? They were here this weekend, and I can safely say that the treehouse passed with flying colors! I was thrilled that the promise I made to my granddaughter was fulfilled with such success in her eyes. 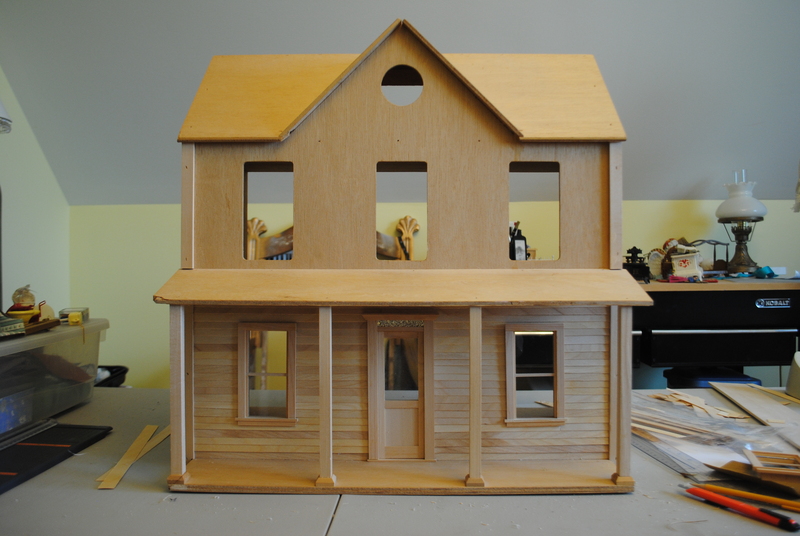 It has been a VERY long time since I’ve worked on the dollhouse. 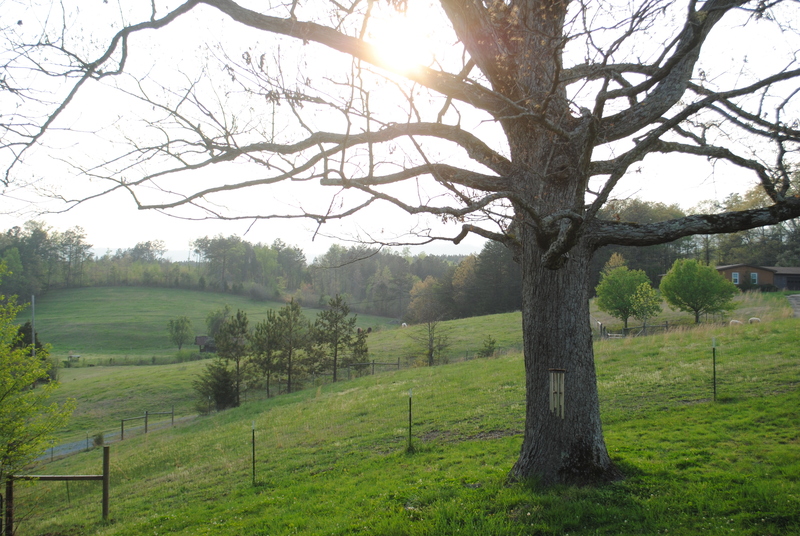 The farm has taken up more of my time this past year as my husband was finishing his third year of a counseling master’s degree along with a full-time internship. When he graduated in May, I got him busy working on my huge “Honey Do” list, which lasted most of the summer. Now he’s gotten it mostly done and has started his first counseling job. 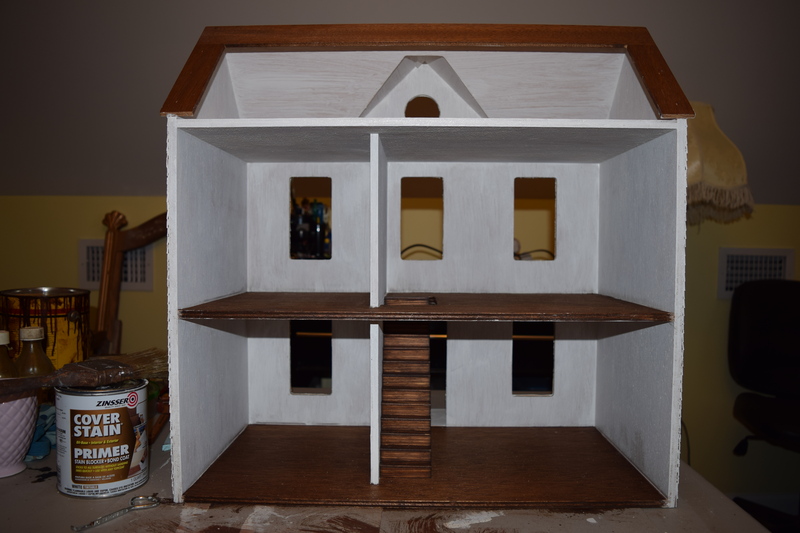 So I am finally getting back to work on the dollhouse in Narnia! 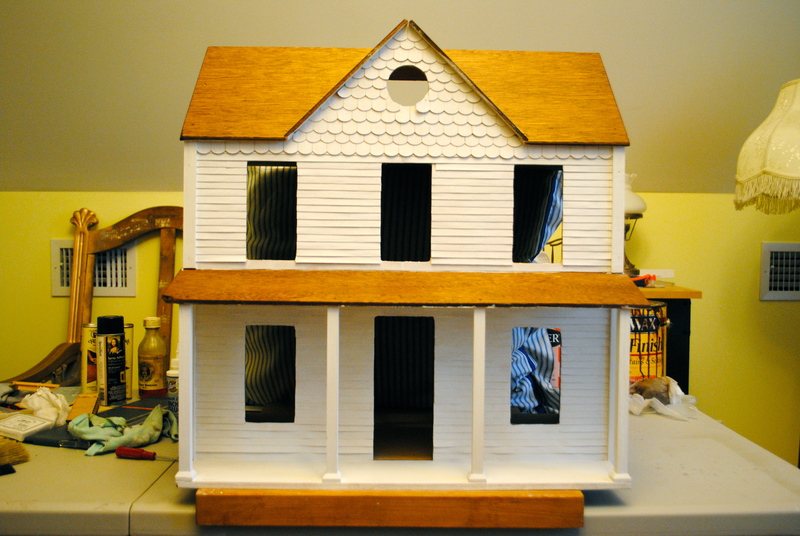 I left the dollhouse so long ago with the exterior siding repaired and (finally) primed correctly, with an oil-based primer. The inside remained untouched and neglected . . . The first thing I did was to stain the floors of the first and second stories of the house. 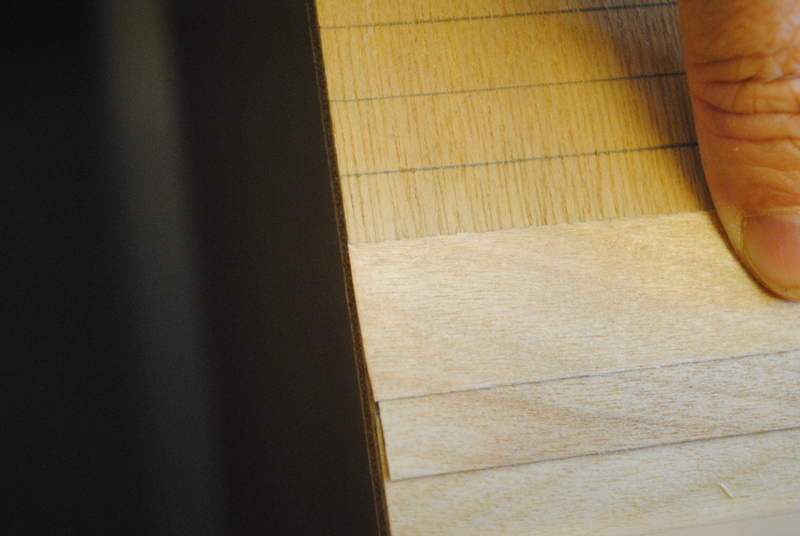 I plan to cover them with narrow floorboards, but there are bound to be tiny gaps. A dark stain underneath will make them look more realistic than if I left the white pine showing through. 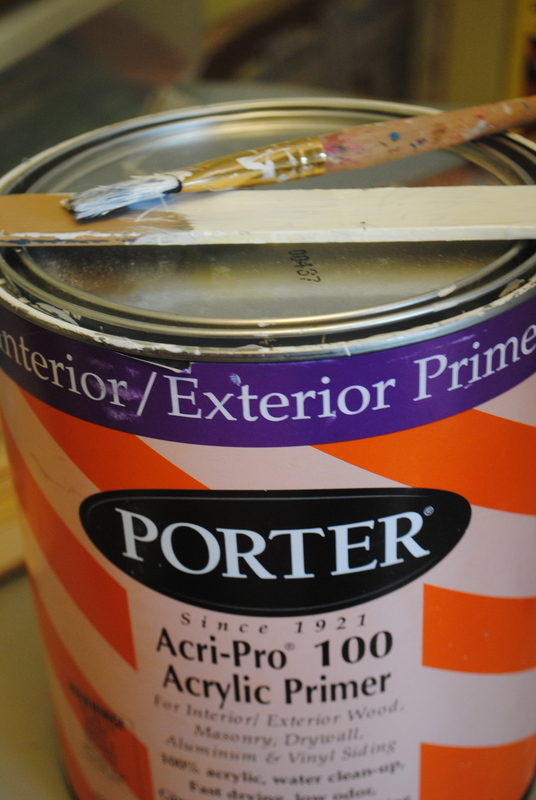 The second step was to prime the interior with the same oil-based primer. I started up in the attic and primed the ceiling, walls, and floor–because I intend to cover it with “linoleum” instead of wood flooring. 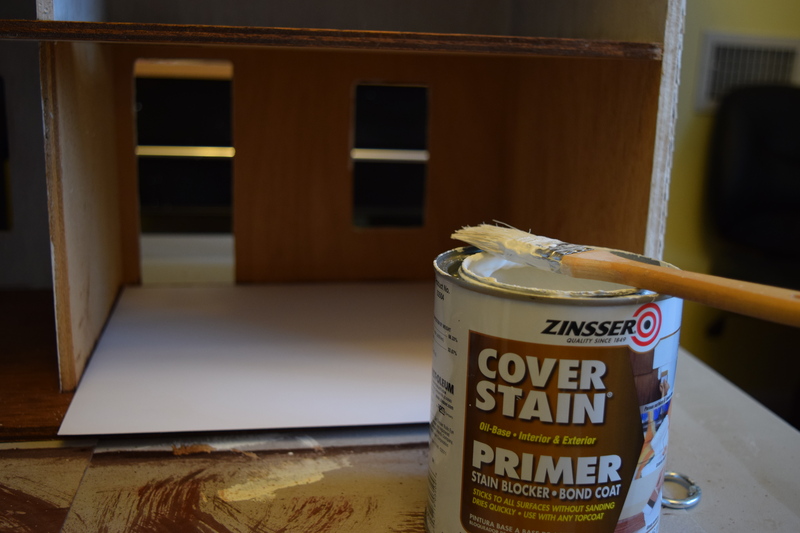 Back to the priming–you’ll notice that I opted to use a disposable paintbrush because I’m lazy and HATE cleaning oil-based paint out of expensive paintbrushes. I’ve finally learned that I won’t do it, and I’ll just have to throw them away–so now I buy disposable ones to begin with! When I was ready to start priming the walls of the first and second stories, I needed to protect my stained floors from the primer. I knew that the spaces were too tiny to effectively put down masking tape, so I came up with another solution: scrapbooking pages. I have bought many scrapbooks that had white pages in them that I removed to replace with colored paper. Being a bit of a pack rat, I kept all those white pages because I knew they would come in handy some day. Well, Some Day had arrived! Once one side of a room was painted, I put a new, un-painty scrapbook page in the other half and held it down as I painted along the edge of the floor. I used 8 x 8 pages in the small rooms and 12 x 12s in the large rooms. Any little smears of white paint were easily wiped away with my still-damp stain-wiping rag, and everything ended up looking pretty good. Now that the painters were temporarily done, it was time to call the electrician! 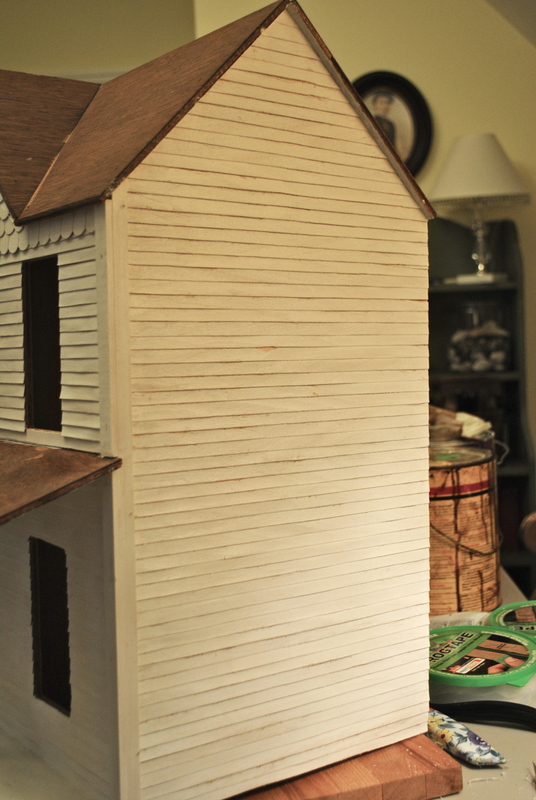 It’s been three months since I worked on the dollhouse. Since the last post about the ripples that appeared after I painted the siding, things got even worse as the paint dried. I was so discouraged that I just didn’t know what to do, so I did . . . nothing! But poor little Charis is longing to play with the dollhouse, so I just had to get back to it. Yesterday it snowed and again today, so it seemed like a good time to get to work. 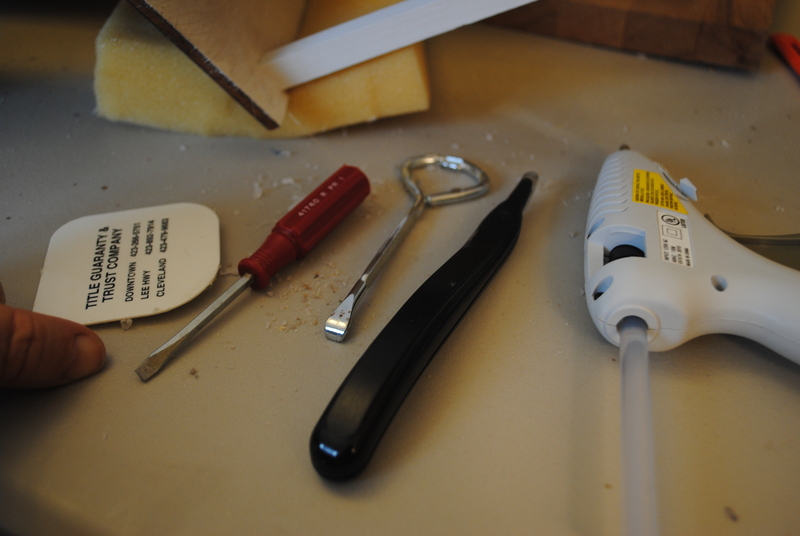 I had already bought a mini hot glue gun, and I gathered some potentially useful tools to go with it: A plastic pot scraper, a small screwdriver, a paint can opener and a staple remover. 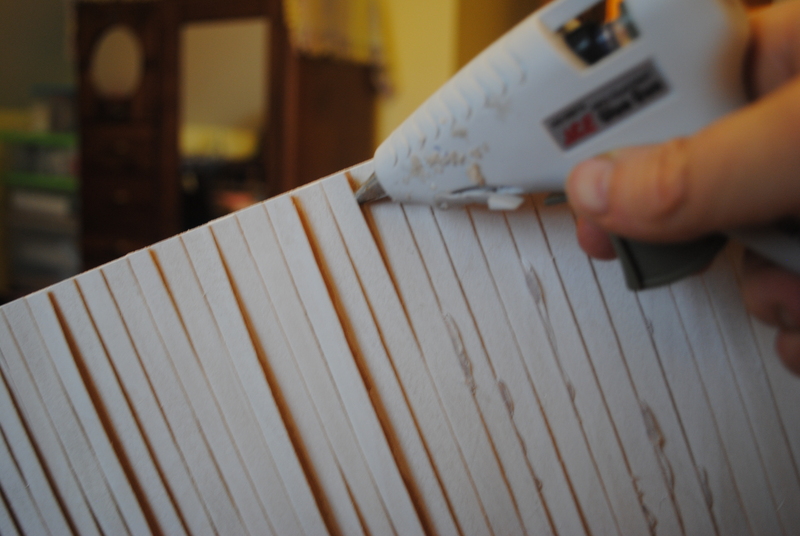 I began by inserting the tip of the hot glue gun into a crevice under a siding board and running one third to halfway along the board. Any more than that was too much to press down until the glue cooled. In the long run, the business end of the staple remover worked best. The first day I worked, I removed the excess glue as soon as it cooled enough to touch. This was not a good idea, as you can see from the photo above. 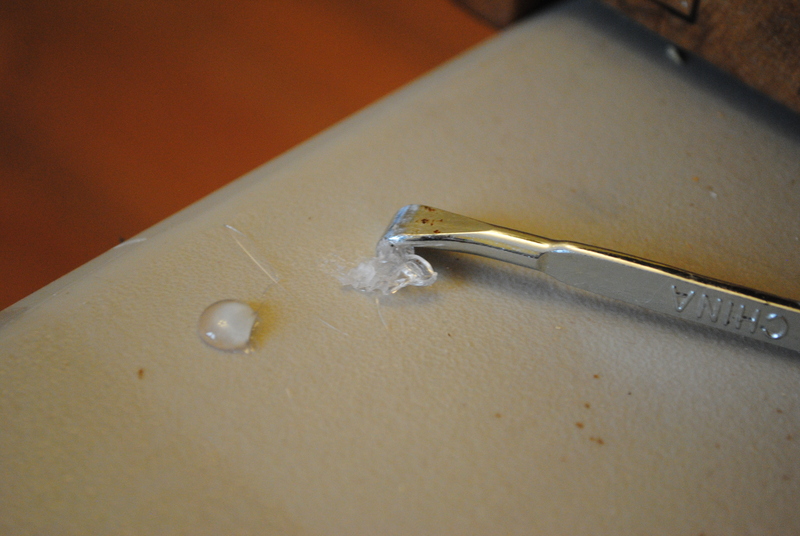 Hot glue needs to cool completely before the excess is removed, or it is almost impossible to remove. 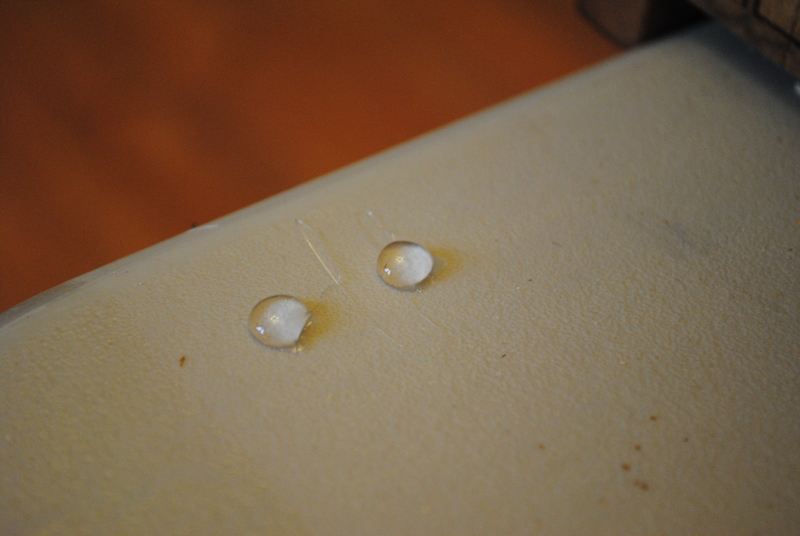 Here’s an experiment I did to prove the point: two blobs of hot glue on the plastic table, a surface that will be easier to clean than wood. As soon as the glue cooled, I began to remove one blob. Even when I managed to scrape it away with much effort, some still adhered to the table. A couple hours later after the second blob had set, it peeled off easily without leaving a residue. So when I finished gluing one side of the dollhouse, I LEFT IT ALONE! I didn’t even pull off the temptingly fragile cobwebby strands that formed. It looked really horrible, and it was VERY hard to leave it alone! But I did. I glued the second side and a bit of the front and then . . . I unplugged my glue gun and went away overnight. 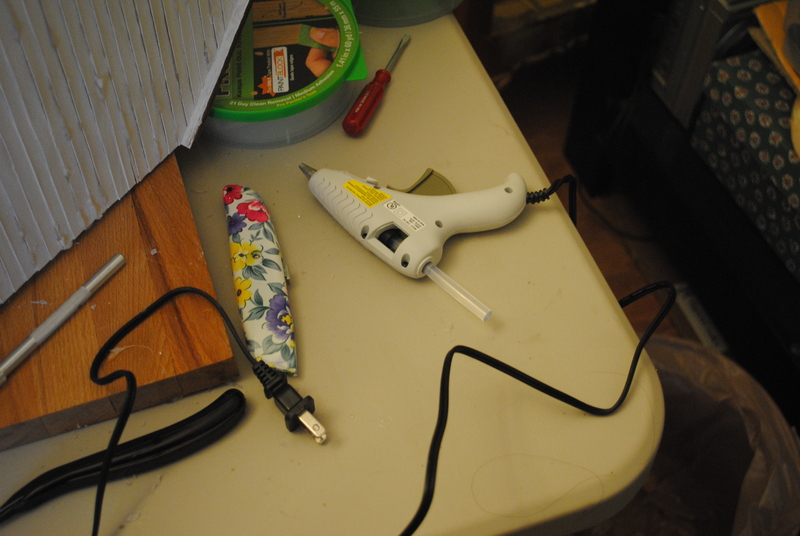 Always, always unplug the glue gun, even if you think you are just leaving for a few minutes. You might get distracted doing something else and forget to return and unplug it. 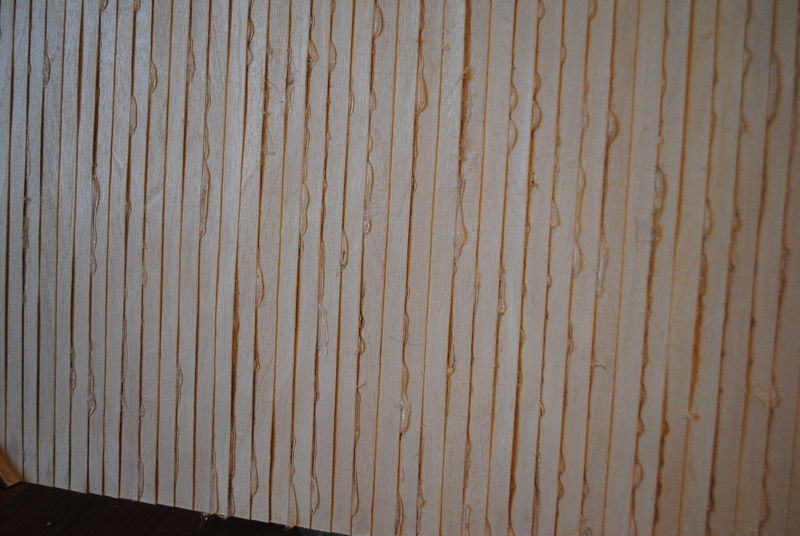 When the snow turned to nasty freezing rain this afternoon, I was glad to head upstairs and begin carving excess glue off my siding. 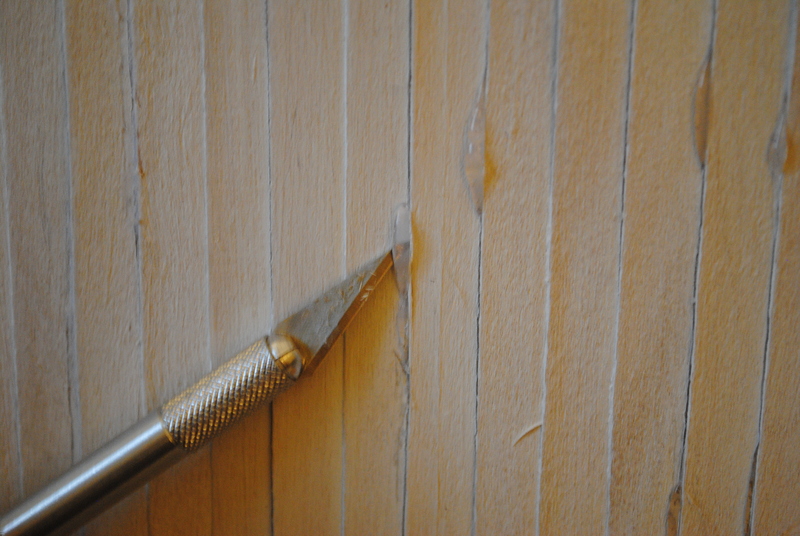 First I slipped an Exacto knife under the side of the glue and sliced it free from the siding. Next I held the knife vertically and sliced down to the siding. This was a very tedious job which I did with extreme care, both for my fingers and the fragile siding. Once the glue was sliced loose, it was easy to peel it away. If there was any residue left, I found the small screwdriver extremely helpful in scraping it away. Sometimes a thumb nail worked well, too, but the screwdriver has the advantage of not getting sore! After several hours of steady labor, one side was finished. It doesn’t look near as good as it did before I painted the siding in the first place, but it’s a far sight better than what it looked like yesterday! 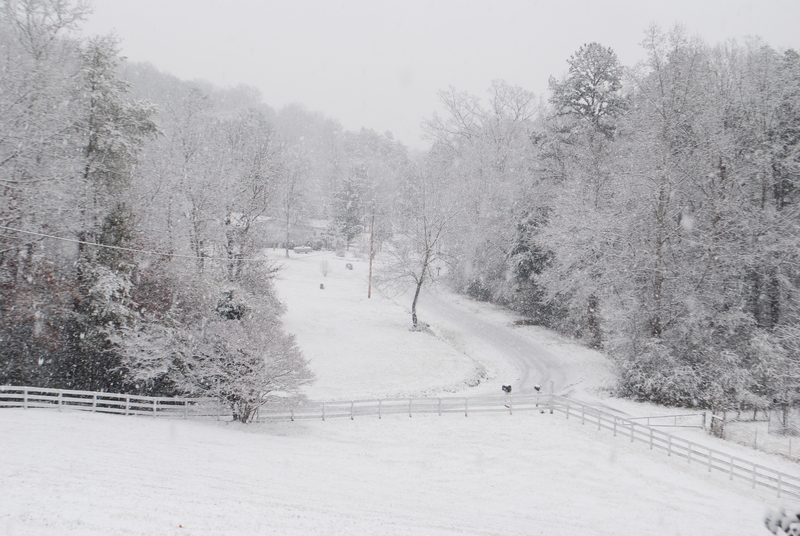 When I looked out the window I was astonished to see that the freezing rain had turned back into snow, which was falling heavily in giant flakes, creating a real winter wonderland outside. 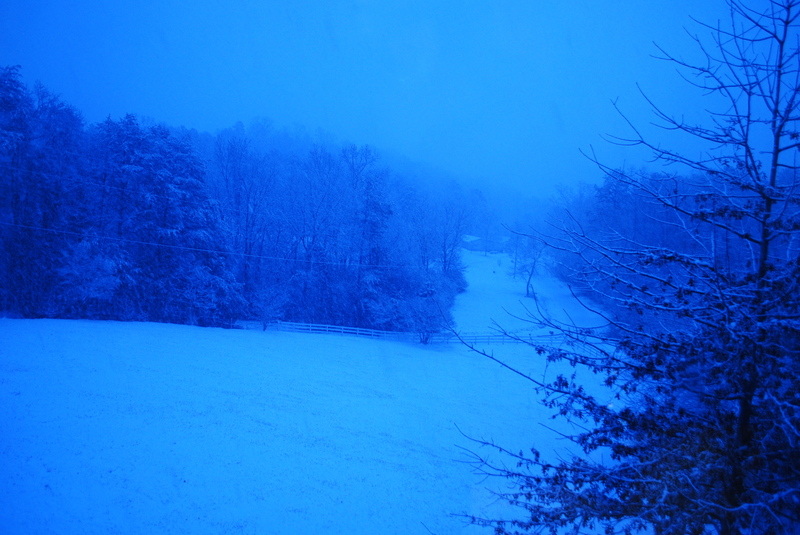 Although the evening light was really blue, I was personally feeling a whole lot less blue! It looks like the dollhouse and I might both come through the storm okay. 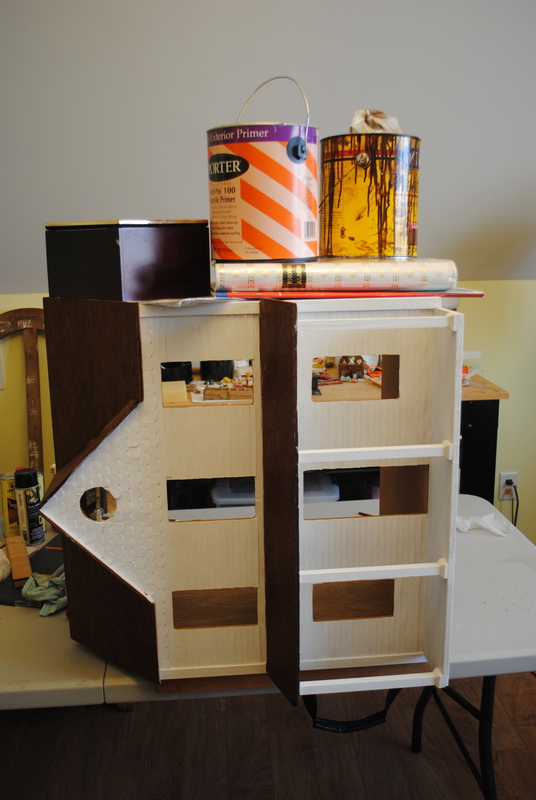 Monday I painted and stained the dollhouse. On the roof, I used the stain left over from the woodwork in Narnia, applied it with a rag (using plastic gloves), and touched up with a brush. Then I wiped it with another rag to even out the color. I then turned a glove inside out over the stain-filled rag and twisted it shut. That way it’s ready to go if I need to touch anything up. 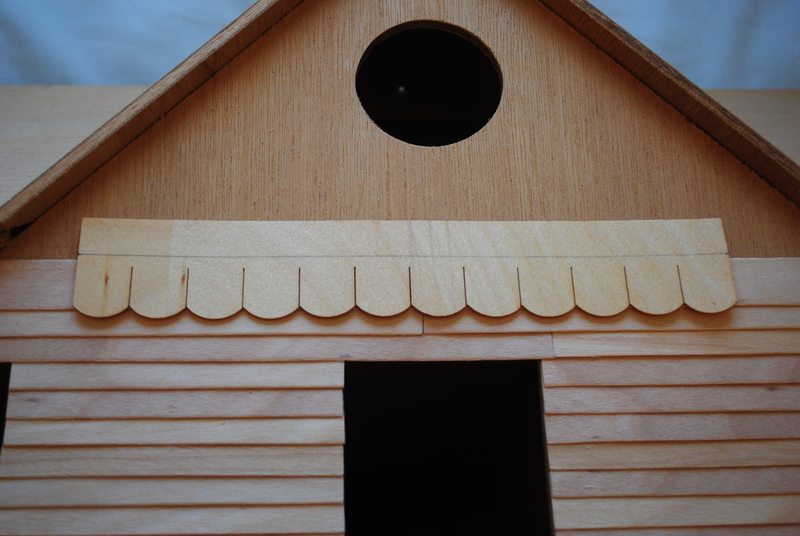 The roof will get shingles, but the stain on the base helps hide any gaps between shingles. Here’s what it looked like when I finished the roof. Next I primed the siding, again using leftover primer from Narnia and a soft, narrow artist’s brush. I sat down to paint so I could see up under the boards and make sure I covered everything. When I got to the first floor of the house, I tipped the house back using a Kleenex box so I could make sure everything got covered. Occasionally it was necessary to brush upwards to get the line underneath each lap board covered. Once I had the tricky little parts done, I tried using a larger brush to make things go quicker. I quickly decided that the larger brush put too much paint on, so I abandoned it. You can already see a problem developing . . . The lap siding began to ripple. Even though my primer was older and fairly thick as opposed to being very liquid, the water content made the siding more ridgy than Ruffles! So I placed the house on my wooden board to try to flatten one side then covered the top side with plastic and weighted it down. Then I abandoned it for the rest of the week. The great reveal on Friday shows that the front of the house doesn’t look too bad . . .
. . . although a close-up under the window reveals some rippling. The sides are the part that doesn’t look so good. It’s SO disappointing after putting so much work into it! Before I put the exterior color on, I need to do some research. Better late than never, I guess! Thank heaven this house doesn’t have seven gables! There’s a gable on each side of the house, and I figured out a plan for siding those back in June. 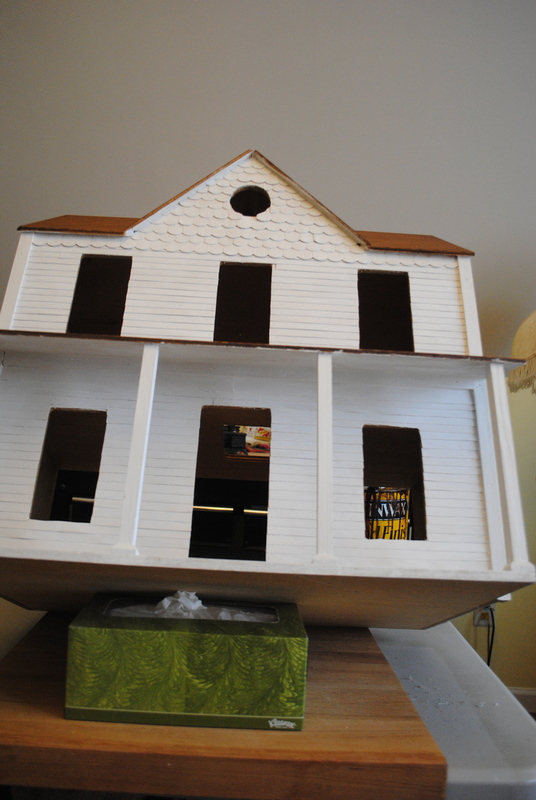 The last time I worked on the dollhouse was in September when I sided the downstairs half of the front. The procedure I used is explained in a previous post. A week or so ago I applied the upstairs siding to the point where the gable started, and then I stopped. I knew I wanted to do something different with the gable. 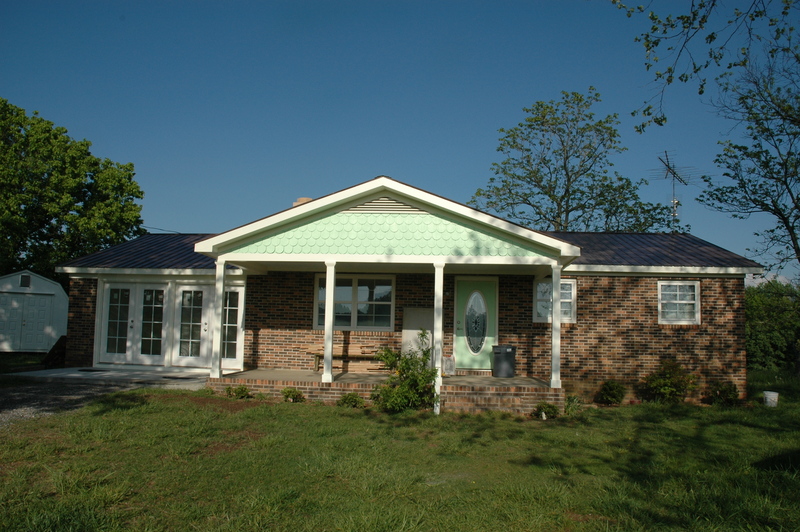 I wanted to use fish scale shingles, just like on this house, a retreat for pastors and missionaries that we maintain on a farm in Alabama. The dollhouse shingles arrived by UPS, and it was time to get to work. 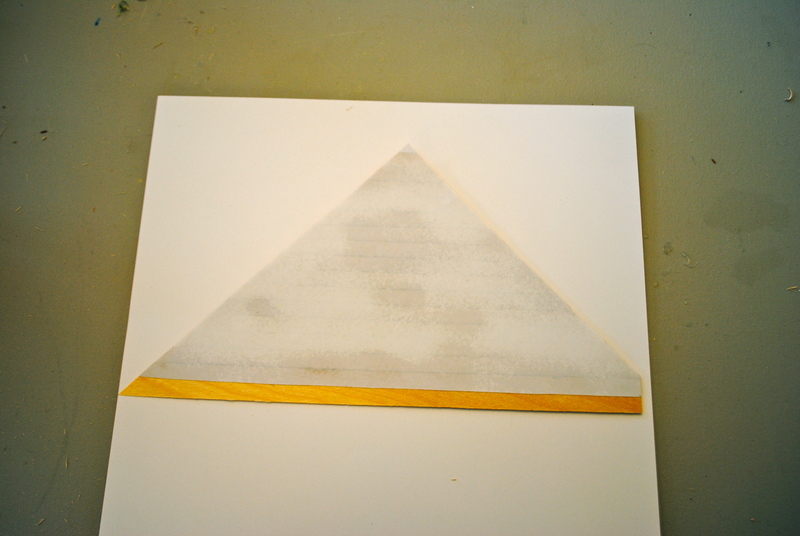 The first step was to make a template and apply spray-on adhesive to the face of it. 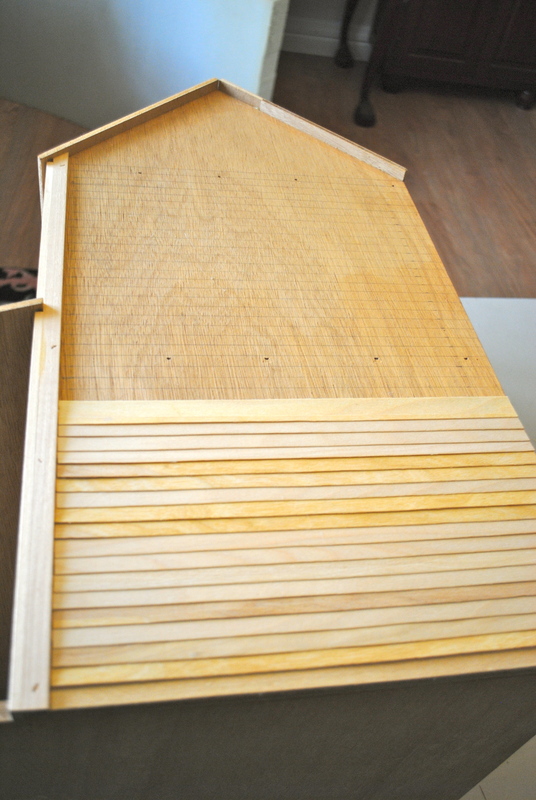 The next step was to apply the first row of shingles across the bottom of the template, laying them on the glue-y side. Here I’ve turned the template over to be sure the shingles are on straight. 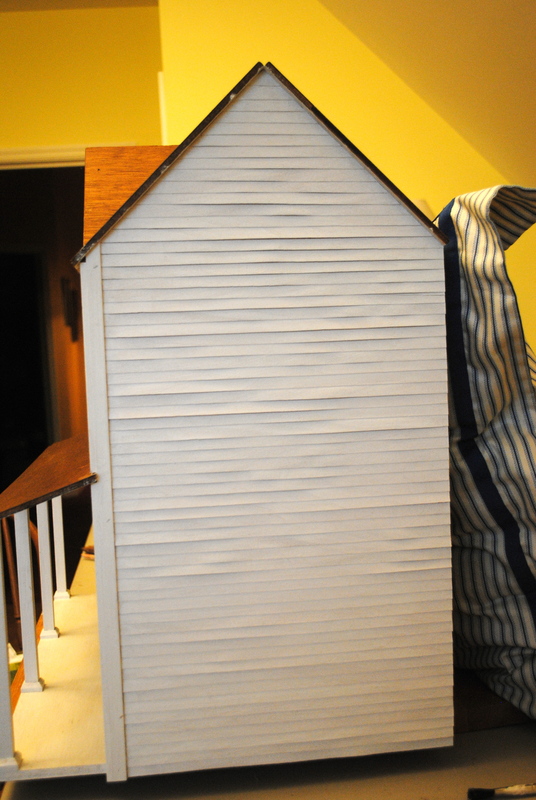 Subsequent rows of shingles went on, staggering the slits between the shingles. 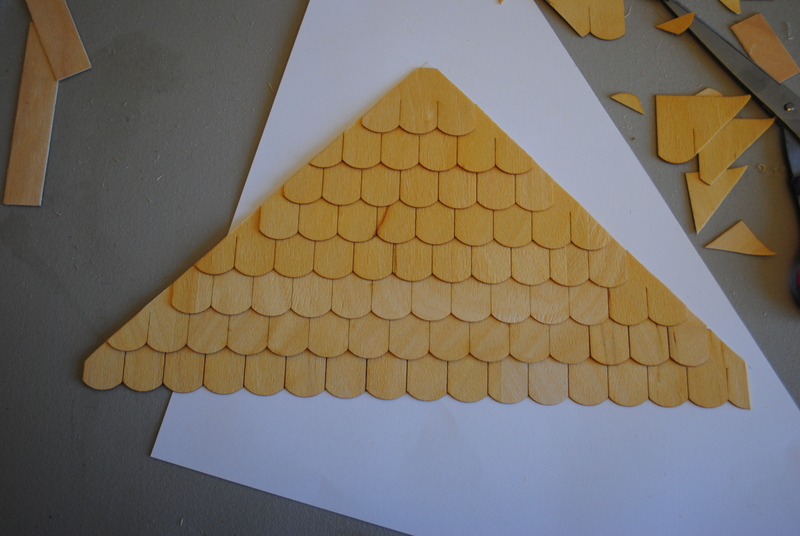 Having learned from the roughness of my lap siding, I ordered laser cut shingles. I did NOT want to have to sand every single shingle! 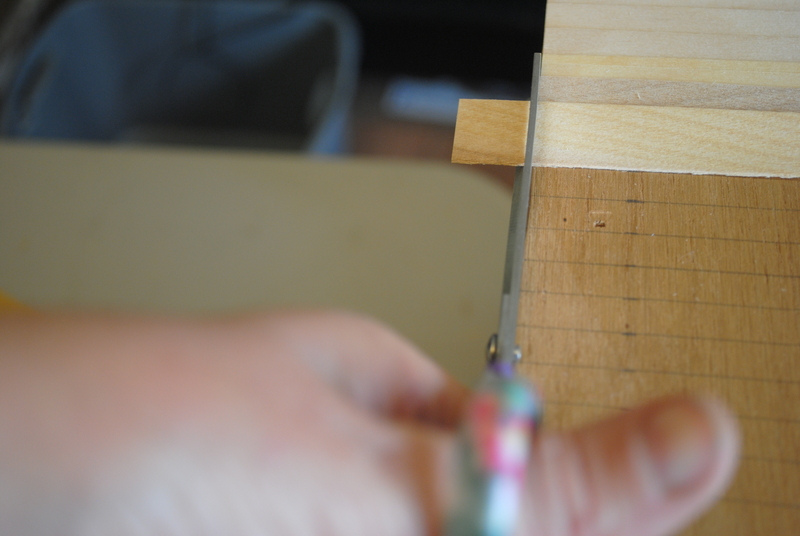 Once all the rows of shingles were applied to the glue-y side of the template, I began to trim the excess off the sides with a scissors. The “gable” looked really nice. 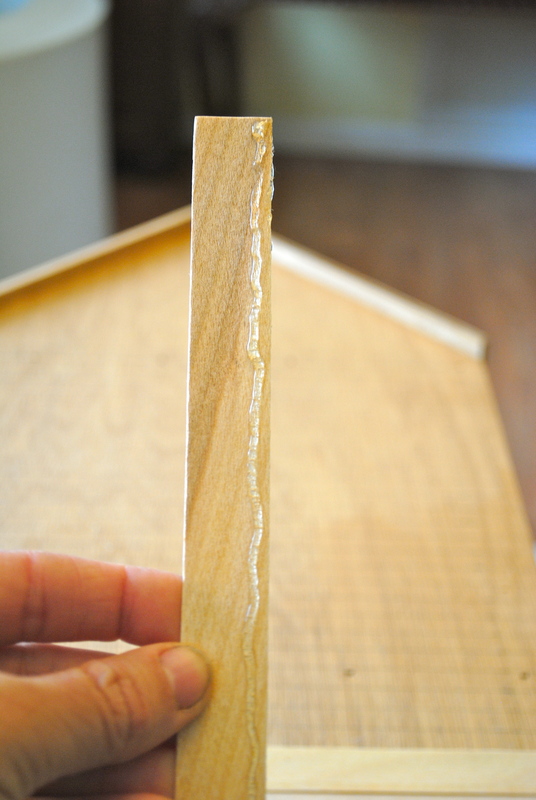 But when I peeled the template off the shingles, that is when things started to fall apart.–literally! 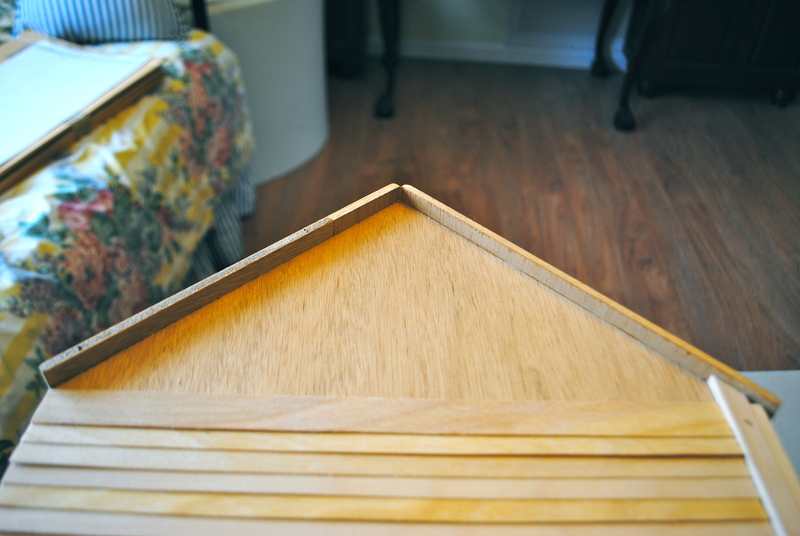 The glue was not strong enough to hold the sections of shingles onto the template, and pieces fell onto the table. I could have pieced the shingle strips and pieces onto the gable of the house without any problem, but I realized that something was missing. I needed a narrow row of shingles to partially cover the last, full-width piece of lap siding. 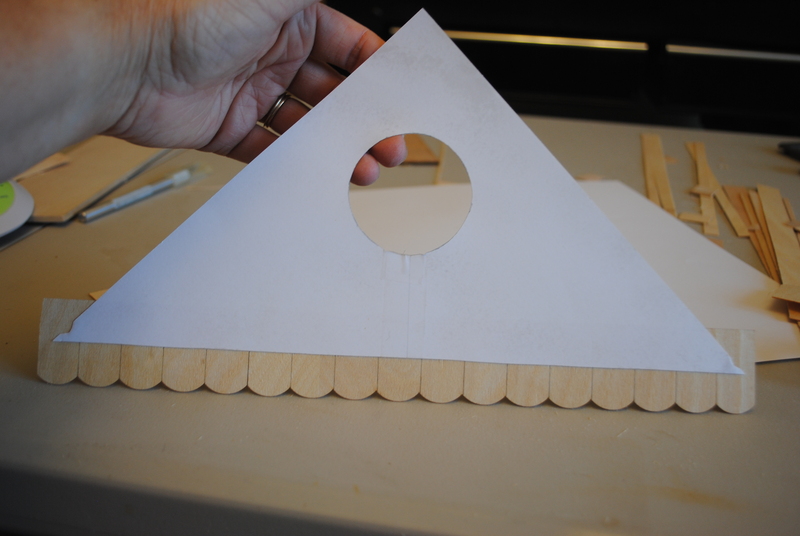 The overhang of the shingles I had glued onto the template was not enough. 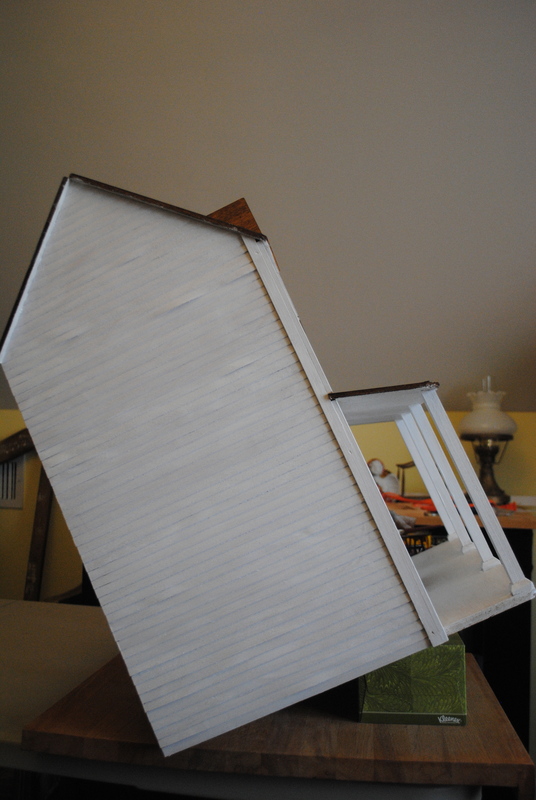 So I drew a line across a strip of shingles, cut down the excess across the top, and glued it overlapping the siding. 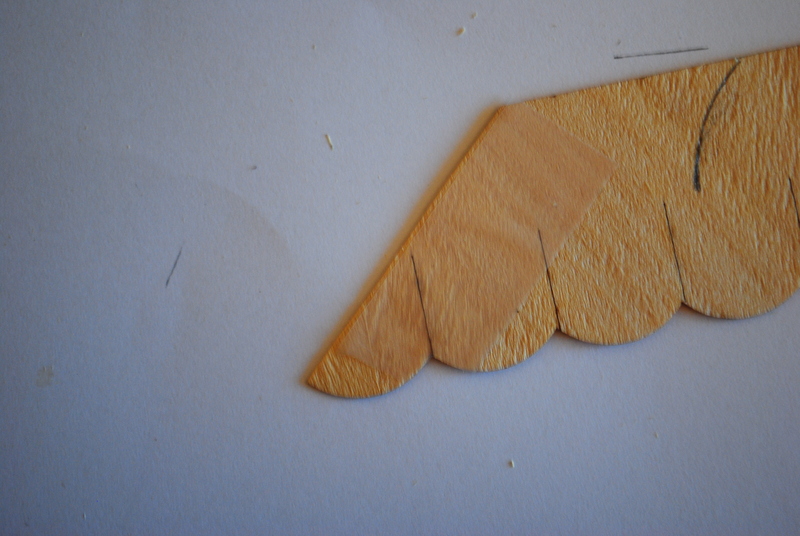 That messed up the cuts I had made with my template, and I had to kind of “wing it” from there. However I was able to use the template as a guide and make adjustments as I went. It was a very laborious process, and I learned a few things the hard way. 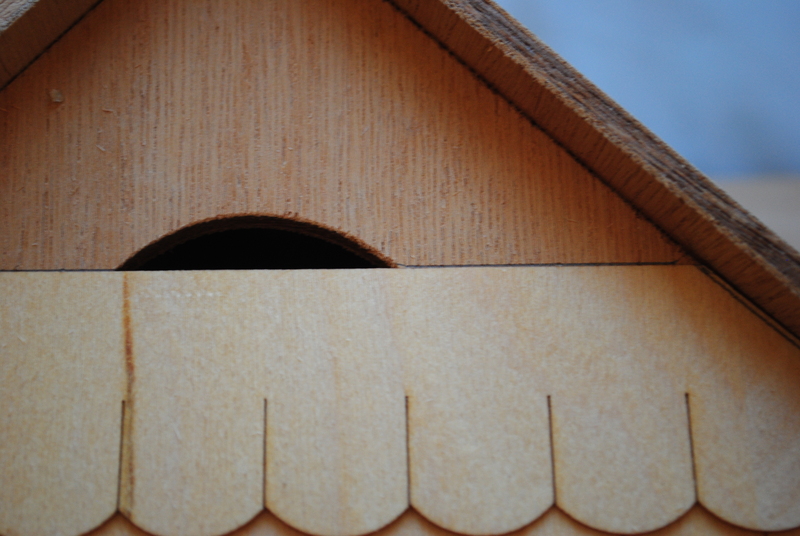 One was this: After I trimmed a length of shingles to size and fitted it in place, I needed to draw a line across the top. Before I learned that, when I removed a strip to apply the hot glue, I accidentally got it on crooked. I had to pry off a whole row of shingles, and as they came up they tore off some of the ones underneath them. Fortunately, because of the almost-separate nature of the shingles, it was relatively easy to rip one or two off without removing a whole row. Another thing I learned was that after I had marked a strip of shingles where it needed to be cut, I cut it a little wider than I thought I needed. It was easy to trim more off–but if I discovered it needed to be wider, it was impossible to replace what was already trimmed off! Finally, I learned that when I was cutting close to the slits between shingles, I needed to apply a piece of Scotch tape on the back to keep the little end pieces from cracking off. And as I trimmed them, I needed to always start my cut at the tip of the “triangle,” cutting towards the border of un-slit wood at the top of the strip. If I cut the other way, ending with the triangle at the end of the curved shingle, a little corner inevitably cracked off. Once I had sized up visually where I thought I needed to trim, and drawn my lines in place, it was helpful to lay the piece on top of the template and check for accuracy. It took three and a half hours, but I was thrilled with the finished project. Temporarily taping the windows in place let me see how good the house looked. Probably the most difficult part of the shingle project was cutting out the round window opening. 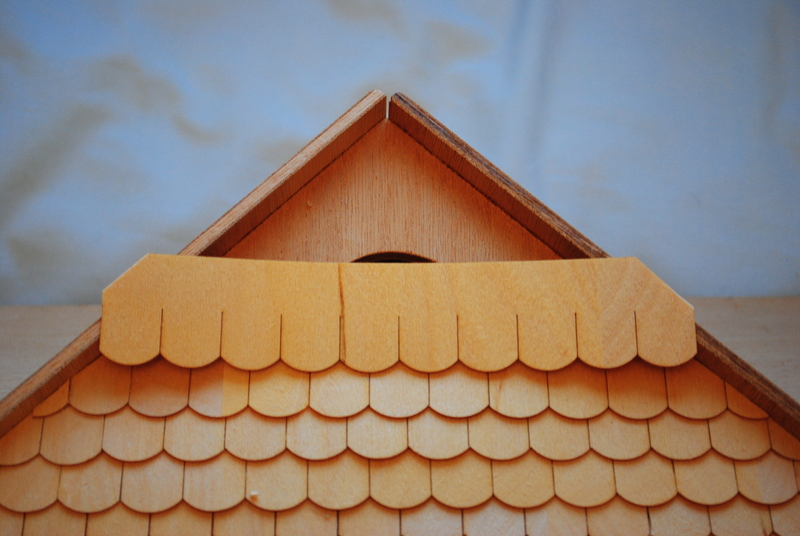 The shingles are much sturdier than the lap siding and consequently much harder to cut through. I could not avoid a bit of chipping around the edges of the shingles, but fortunately the nice wide trim around the octagonal window covers a multitude of sins! 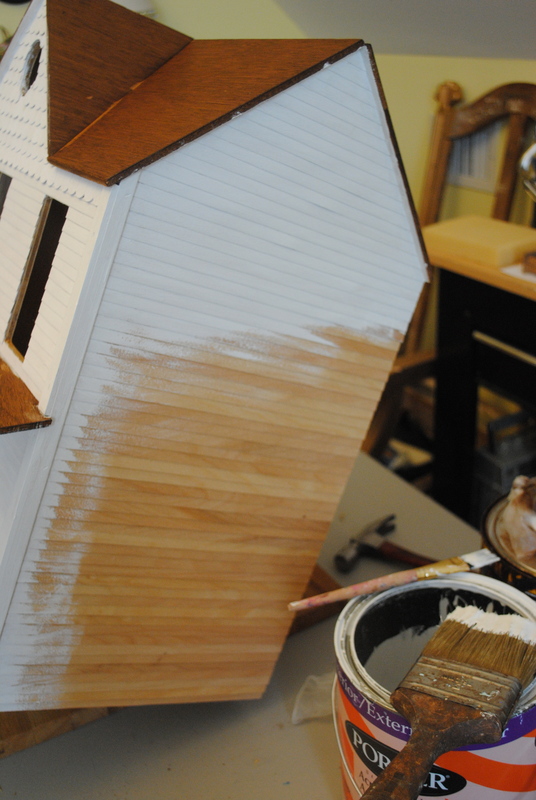 Applying the siding and fish scale shingles has been a slow and tedious process, but now the fun starts–painting and decorating! Following up on my last post, here’s what worked for siding around the windows and doors when my template didn’t. This is what I started out with. I followed several steps for applying the siding. 1) Measure. 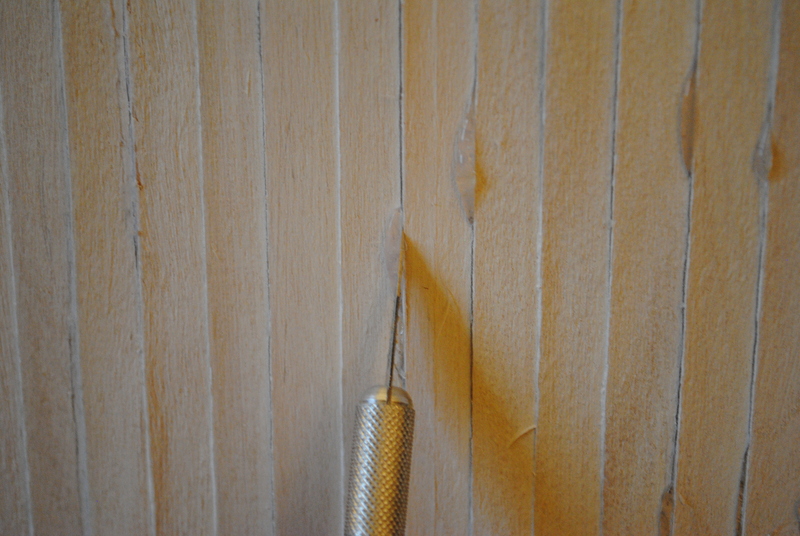 In most places I could hold a siding strip in place and mark it from behind, as in the photo above. Where that was not possible, I held the strip in place and marked it from the front. 2) Sand. 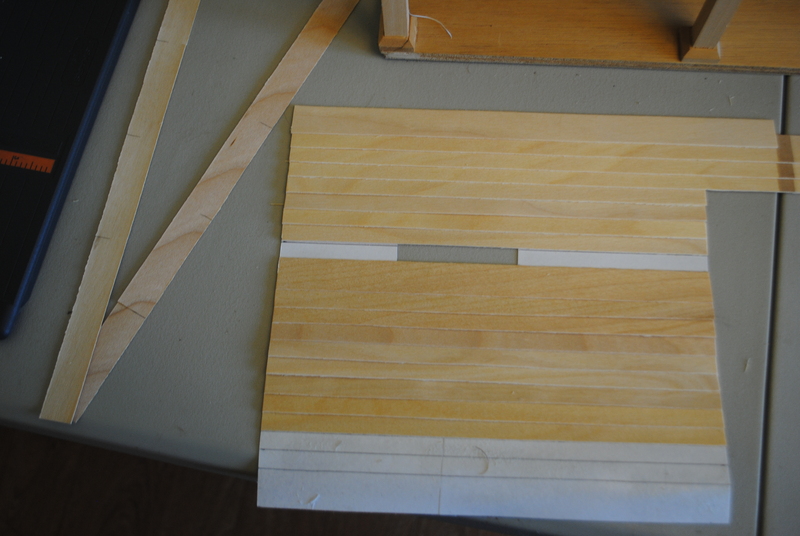 I chose the smoothest edge of the strip and sanded lightly with 220 grit sandpaper for a cleaner look to the siding. 3) Cut. I used a scissors to cut along my marked edge. Whenever it was difficult to get an exact mark because of awkward placement, I cut a slightly longer piece that I thought I needed. 4) Try out for size. 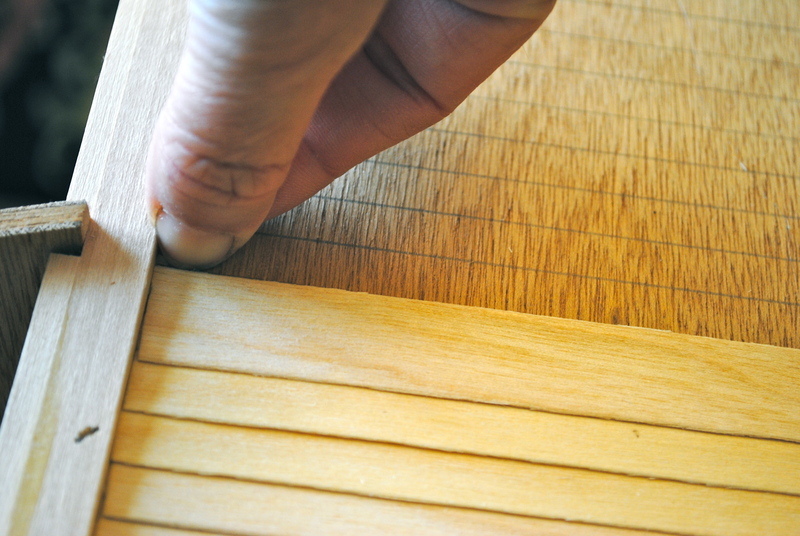 This was the time to shorten too-long strips or even up crooked edges. 5) Apply glue. 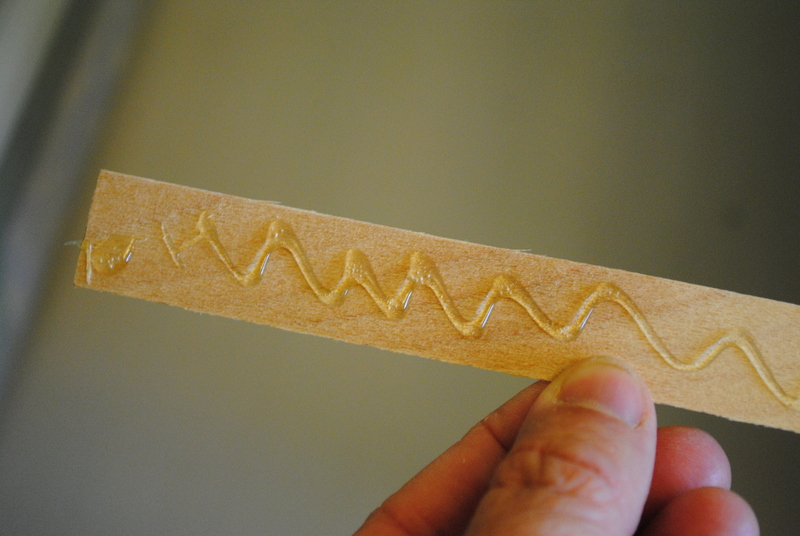 I applied a wiggly line of hot glue and got ready to quickly apply the strip. I tried to be as exact as possible in my work, although I knew that when the windows go in they will hide minor imperfections like the one at the top of this window. One final tip is that when you apply siding you will find that one whole strip us too short to cover certain runs. 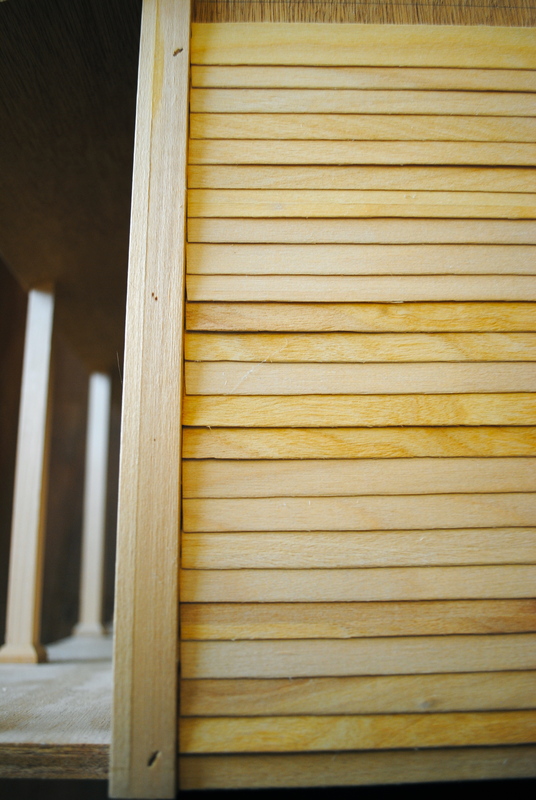 In the case where you need two strips on one length of siding, be sure to stagger the joins so they do not all occur in the same place. If you observe real houses, they never have a “seam” up one side where all the lengths of siding join. To avoid an awkward seam, start succeeding runs from opposite sides of the house. 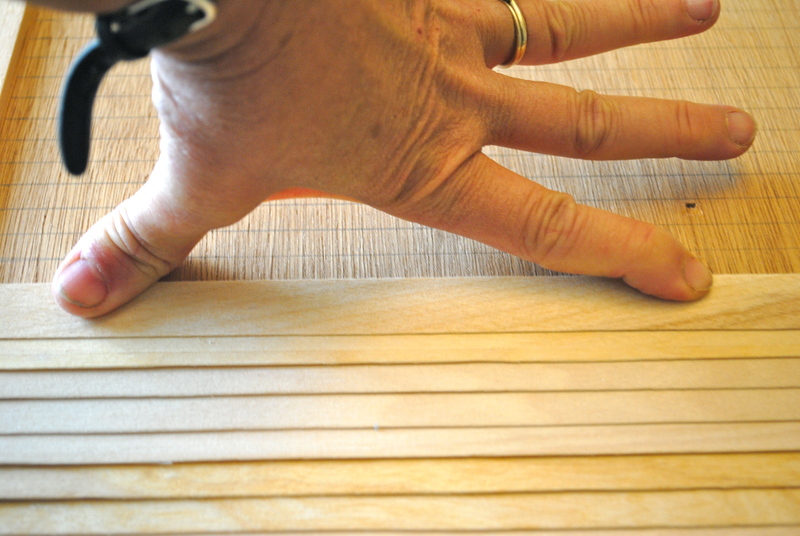 If your house should be exactly double the length of your siding strips, just cut them randomly to avoid creating a seam. In this photo you can see a seam at the lower corner of the right hand window. The others are hidden under the porch roof because that’s where the longest runs are. It was a long, tedious process to get all the siding measured and applied around the windows and doors, but it was worth it in the end when I tried on my windows and door and got a glimpse of the finished house. 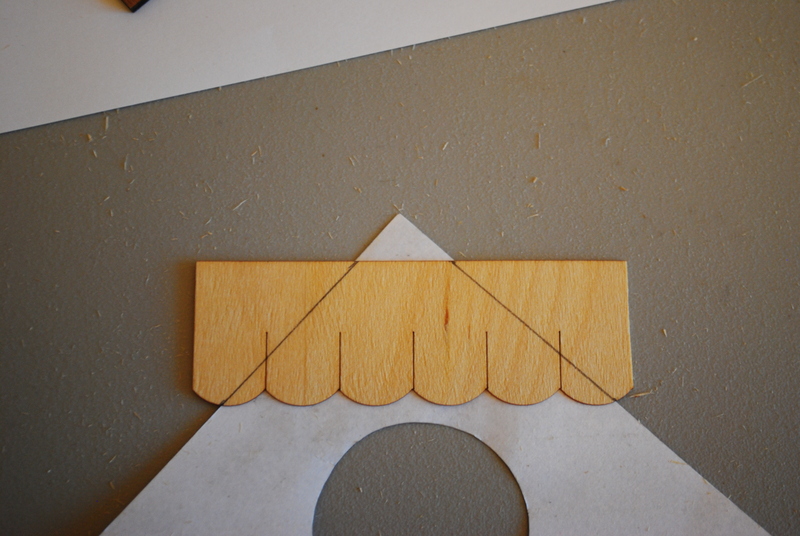 My final judgment on templates is this: They work fine to cut angled shapes like gables where one or two straight cuts are all that are needed. But when you’re working around windows and doors, there’s no method better than what a real carpenter would do–measure twice and cut once–for every single strip of siding! 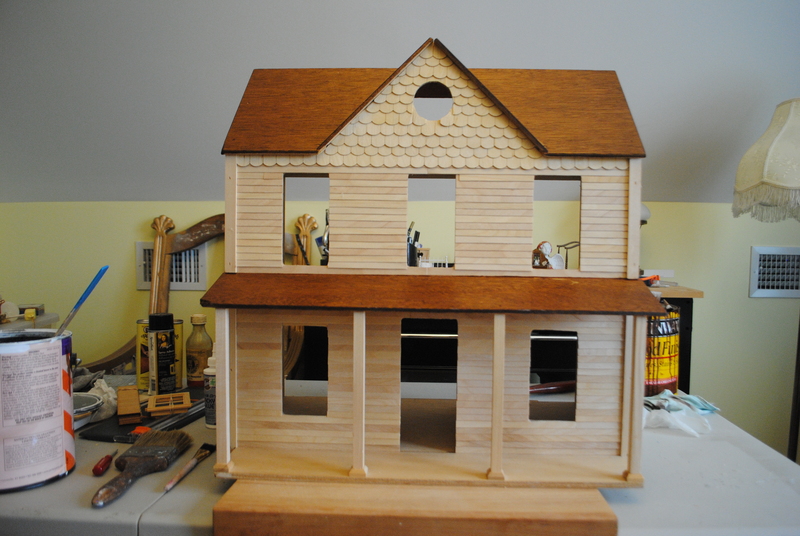 My last post was a tutorial on how a template helped me apply siding to the gable of my dollhouse. 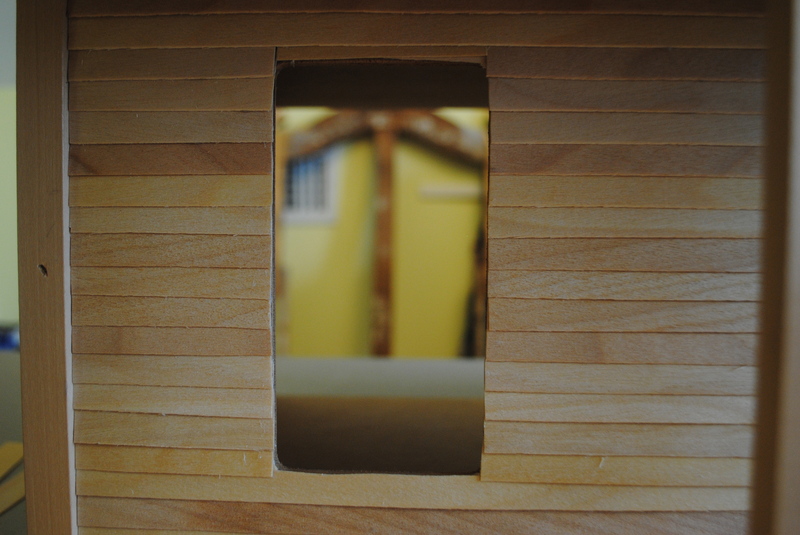 The other day I ruled the lines for the front of the dollhouse, glued a few strips of siding on up to the bottom of the window–and then decided that a template would probably help me fit the siding more easily around the multiple windows and doors. So I cut templates for both sides of the house. 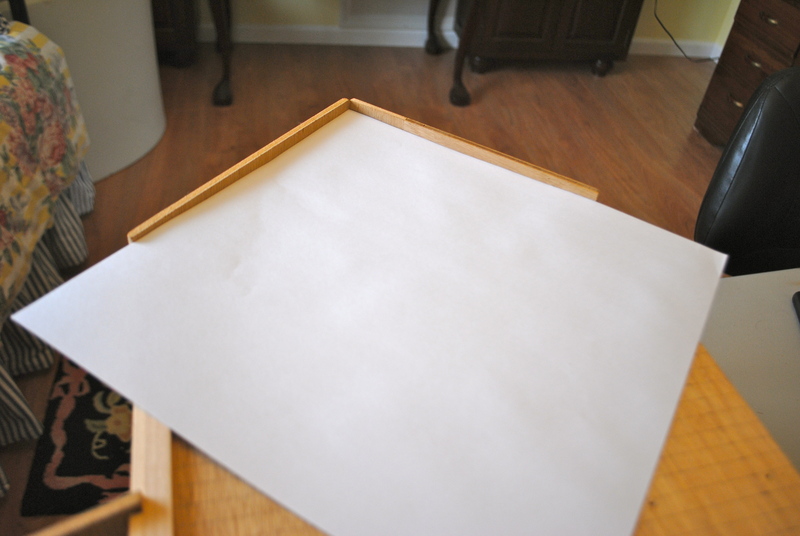 I took lots of photos of me using the 12″ scrapbook paper cutter and other steps in making the template, but I’m not going to post them. You’ll see why . . . 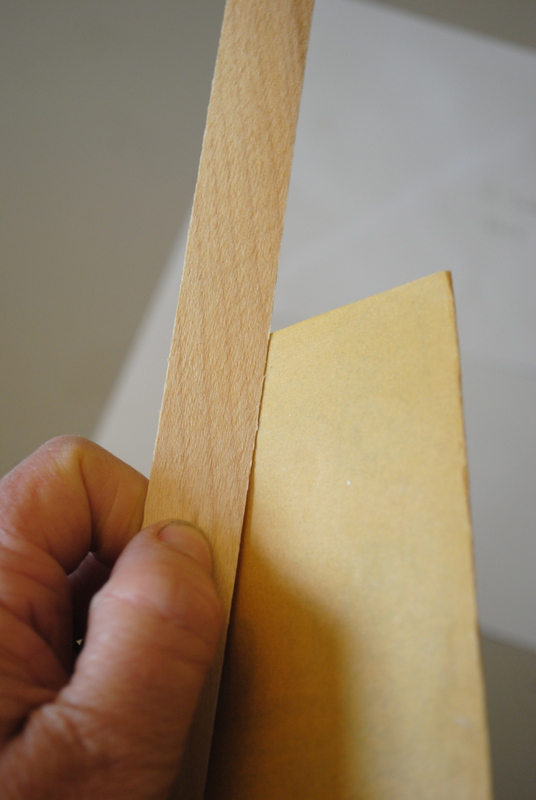 This bag of siding had an irritating defect–a strip of paper glued tightly about half an inch from the end of each strip. 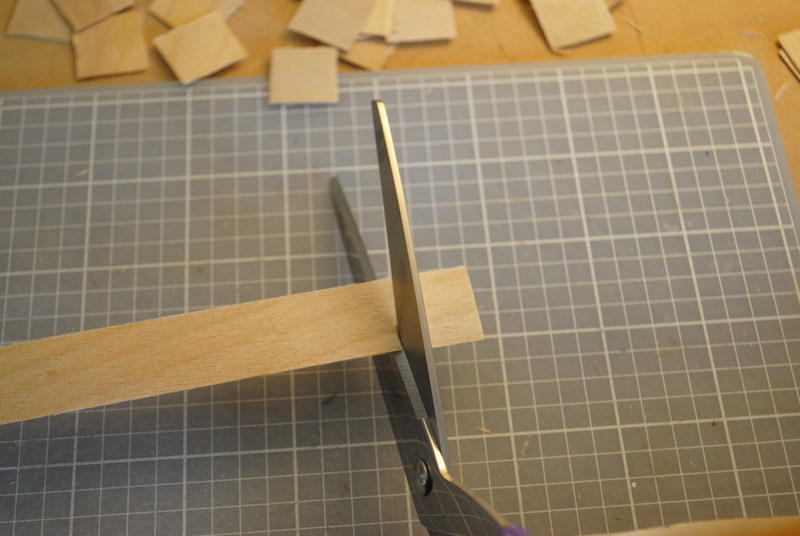 I prefer to take each strip and fine-sand the edge that is already smoothest, then glue it on the dollhouse. 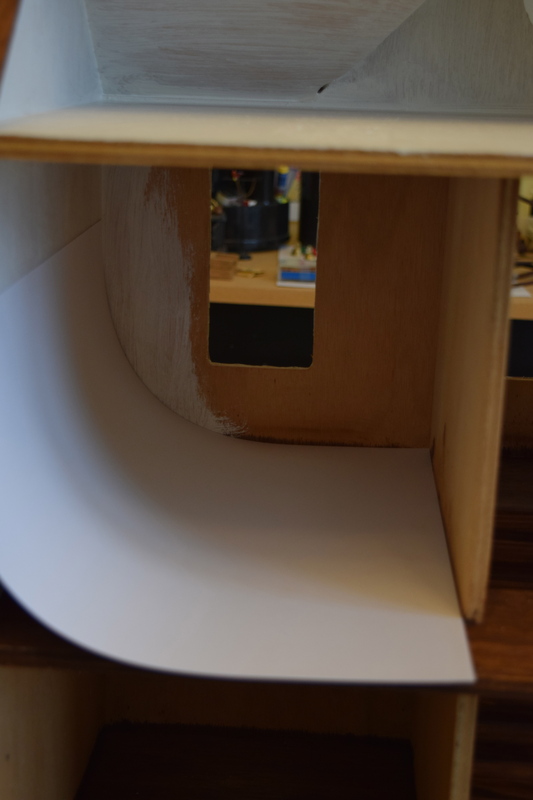 When gluing the siding strips to the template, this sometimes meant that I had to lay the strips in different directions in order to keep the useless papered end far enough out that it would be cut off. That’s why the template looks every-which-way. 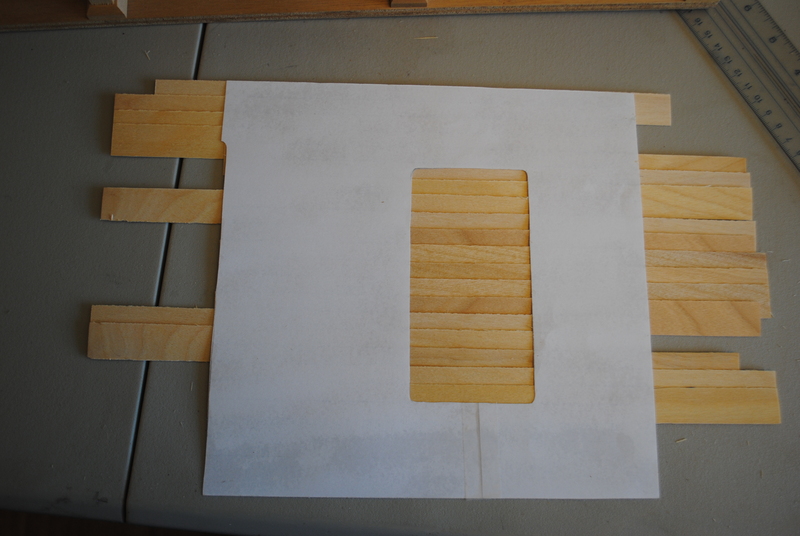 I began cutting off the excess part of the strips, using the template as a guide. Then it was time to cut out the windows. That’s when things fell apart–literally! 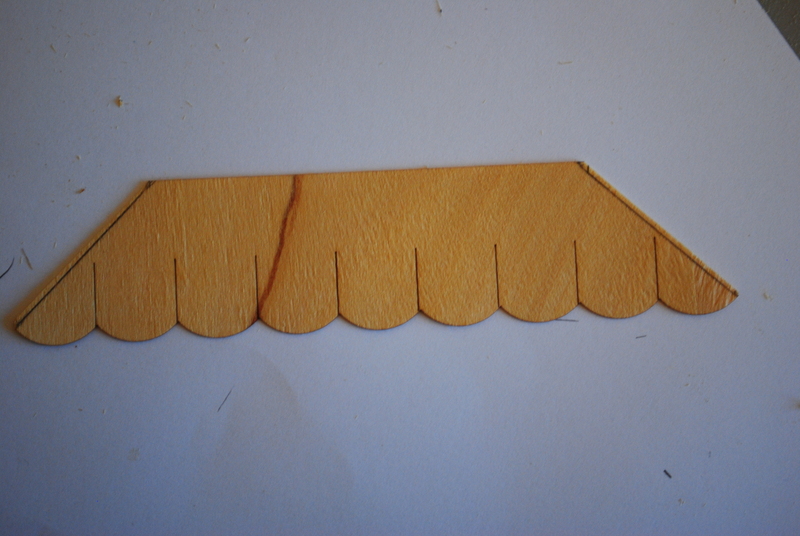 The spray adhesive I used to adhere the siding strips to the template was not strong enough to stand up to that kind of cutting, and pieces began to fall loose. 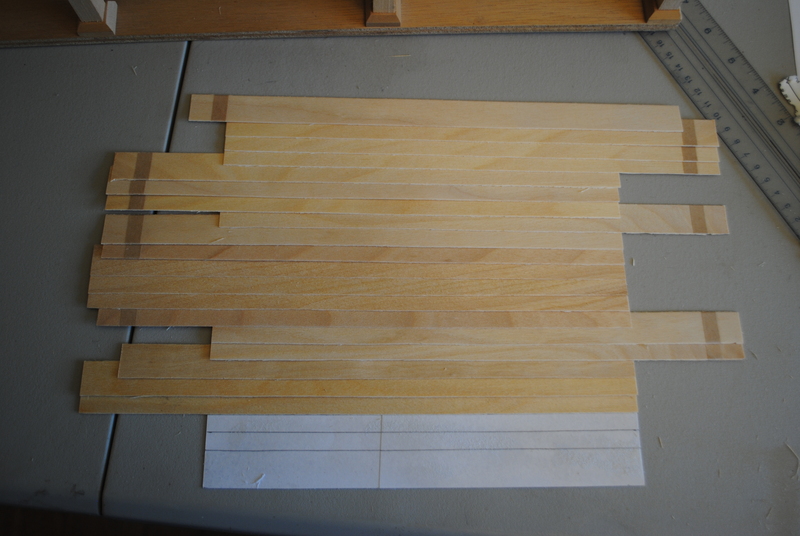 The pieces laying on the table to the left of the template show some of the cuts I started to make before the strips fell off the template. This is when common sense took over. I may have spent several hours making these templates “just so,” but if they were making things harder, it was time to give up. The French say, “Il n’y a pas trente-six solutions.” No, there aren’t 36 ways to do something–but there is more than one! Stay tuned for the next post to see my solution! 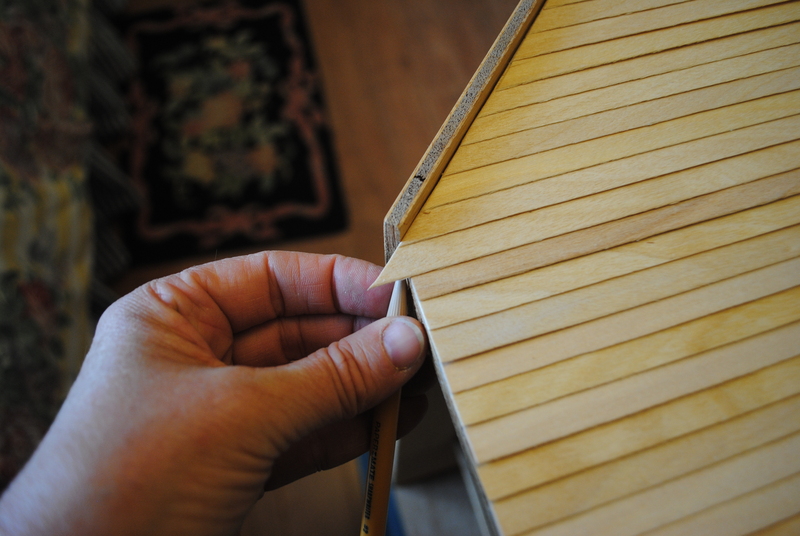 The last post covered the fairly straightforward process for applying lap siding to a dollhouse–and ended when I got to this tricky bit. I entitled this post “‘Tis a puzzlement” because that’s what the King of Siam (played by Yul Brynner in “The King and I”) always said to Anna when he didn’t know the answer to something. It became a favorite quote in our family. Here’s how I solved this puzzlement . . .
Make a template! 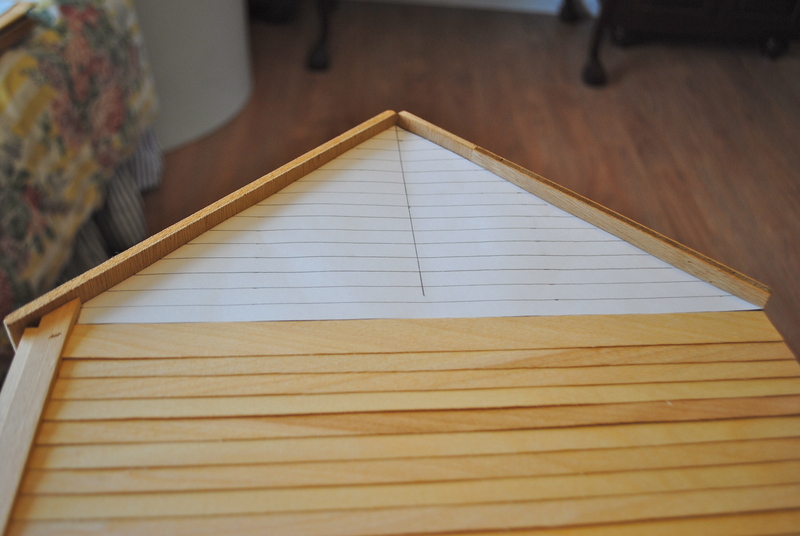 Luckily my gable had an easy pitch to it, and a sheet of sturdy white 12×12″ scrapbooking paper fit perfectly. I used my thumbnail (fingers are such useful tools!) to crease along the line where I needed to cut. 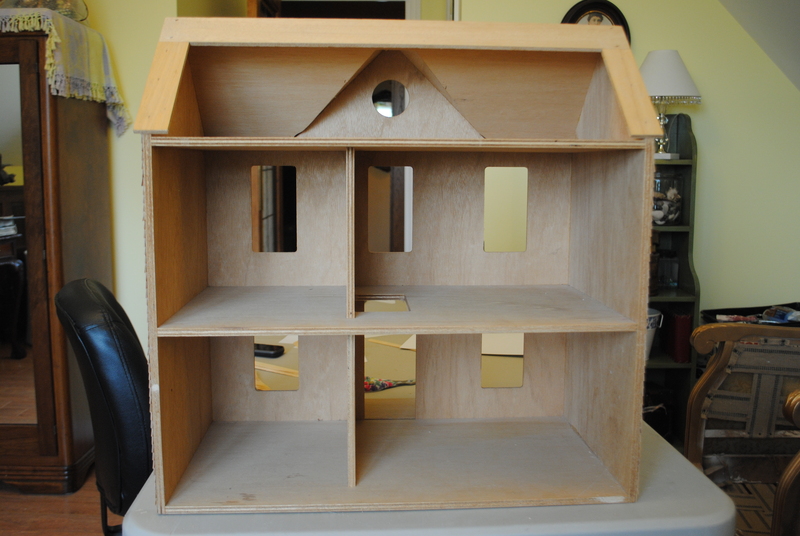 Once I had cut, I replaced the paper template on the dollhouse to be sure it fit. Then I labeled it so I’d be sure to remember which side to use. 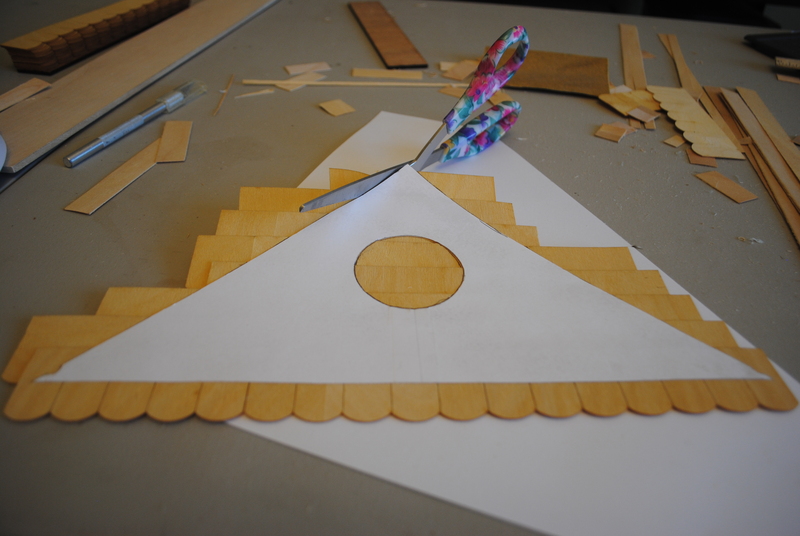 The next step was to rule lines on the template the same width as I had used for the dollhouse. 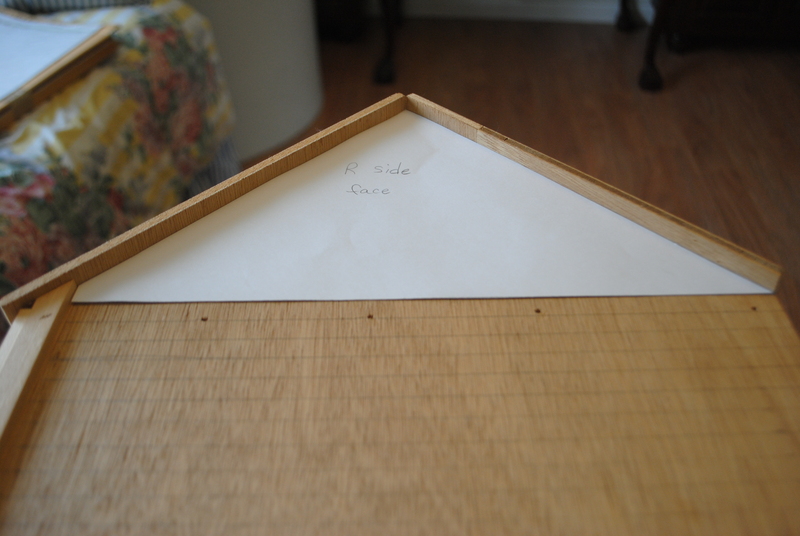 I laid the template on the dollhouse and continued drawing lines on the paper going up from the last line on the dollhouse side. 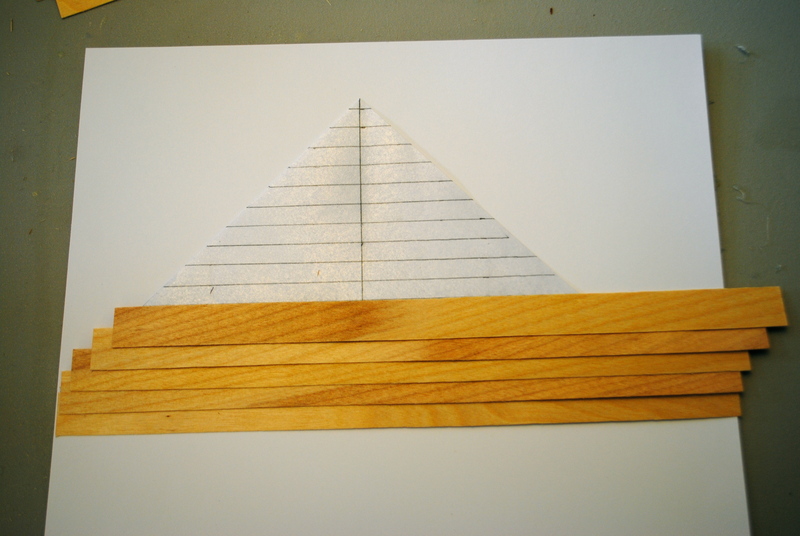 Using the lines will keep the lap siding straight. 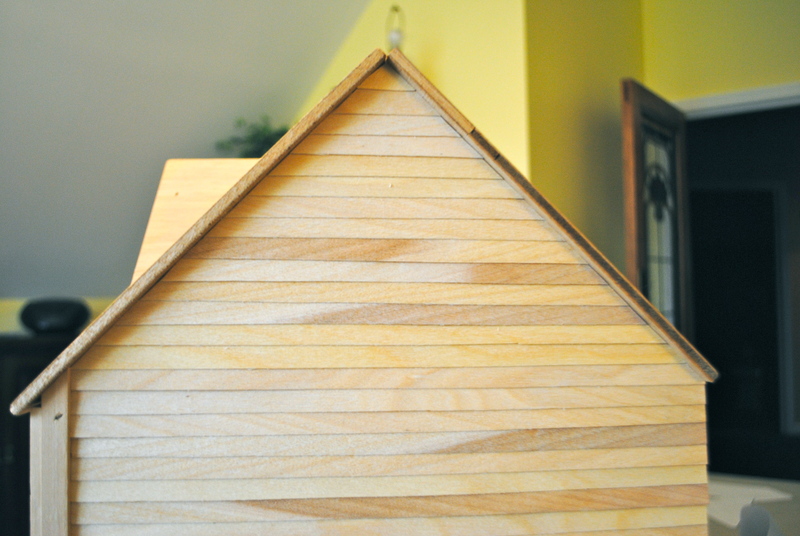 After the siding was glued on up to the bottom of the gable, I checked the fit of the template one last time. Measure thrice–cut once! It was time to break out my handy junk cardboard that I use to protect my table top from messy stuff. 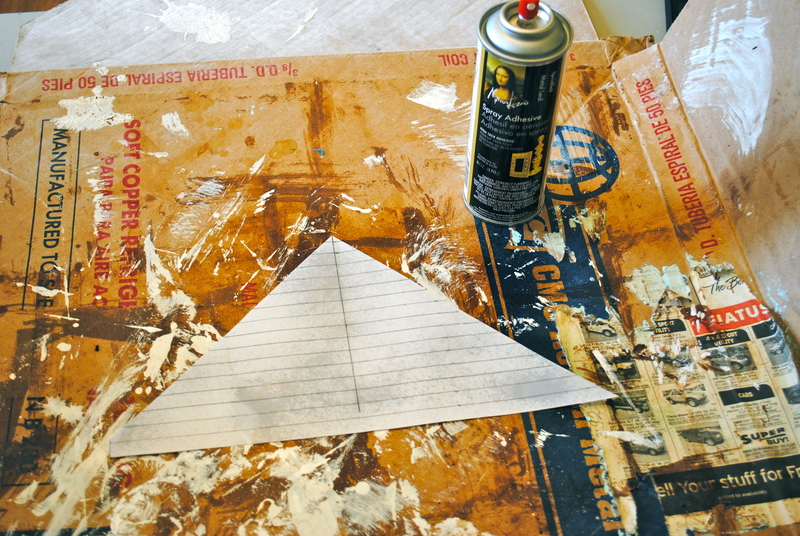 I laid the template on the cardboard and sprayed it generously with spray-on adhesive. 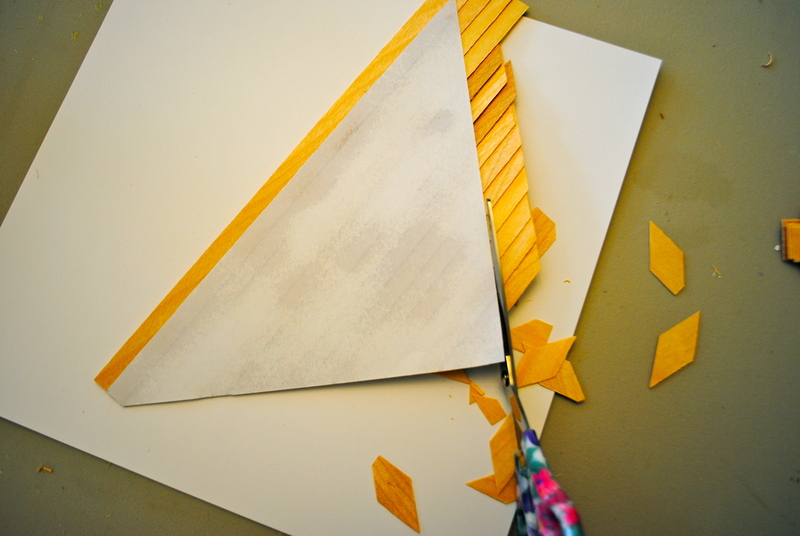 Carefully peeling up a corner of the tacky template, I transferred it to a clean piece of scrapbook paper, sticky side up. 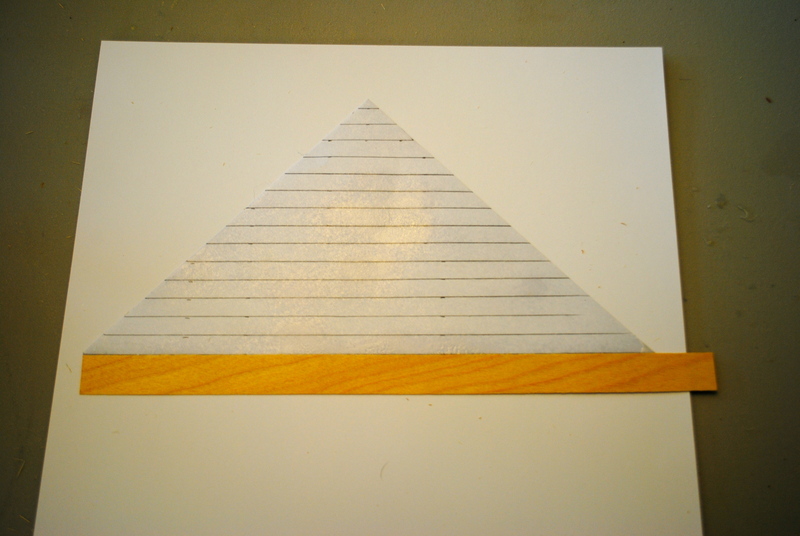 I laid my first siding strip along the lowest line drawn on the template. 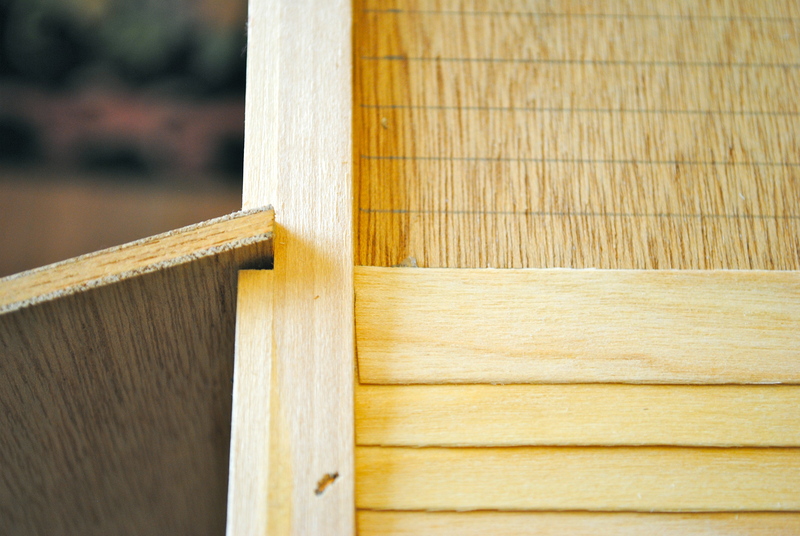 It’s VERY important to leave enough siding strip hanging over both ends of the template. The first time I didn’t, and although it looks fine when you’re looking at it, after you cut it you will discover gaps where the siding didn’t reach. I can’t explain why (probably because I was terrible in math! ), but I know from experience! If you line up your siding strips like I have in this photo, you will be okay. I continued laying siding strips one on top of the other, just like on the side of the house. 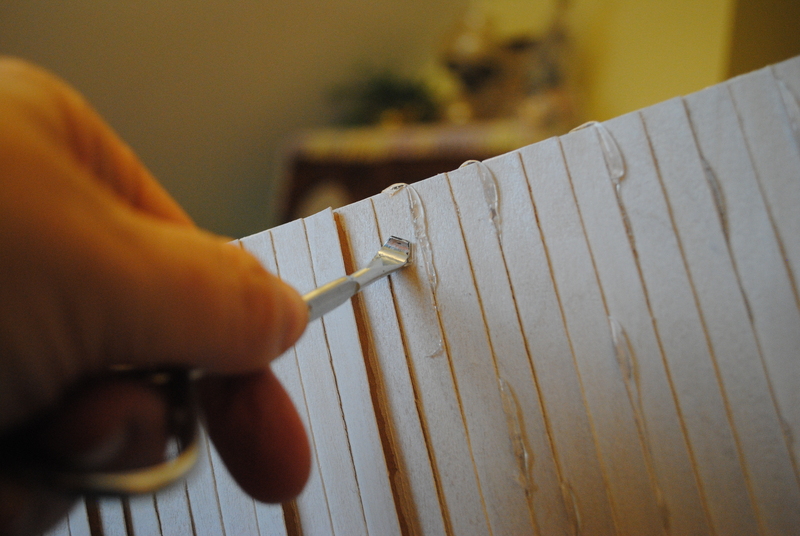 I did not add any extra glue; the spray adhesive was enough to hold the strips in place. I continued all the way up to the top of the gable, finishing off the tiny piece at the very tip-top. Having goofed on my first try, I held my finished template up to the light to be sure that all of the paper was adequately covered. It was! Very gently I flipped the template over and carefully cut along one side . . .
. . . then the other. No, I do not have magic scissors! I couldn’t cut and photograph with my right hand at the same time, so I had to prop the scissors. Once I was done cutting around my template, this is what it looked like on the back. 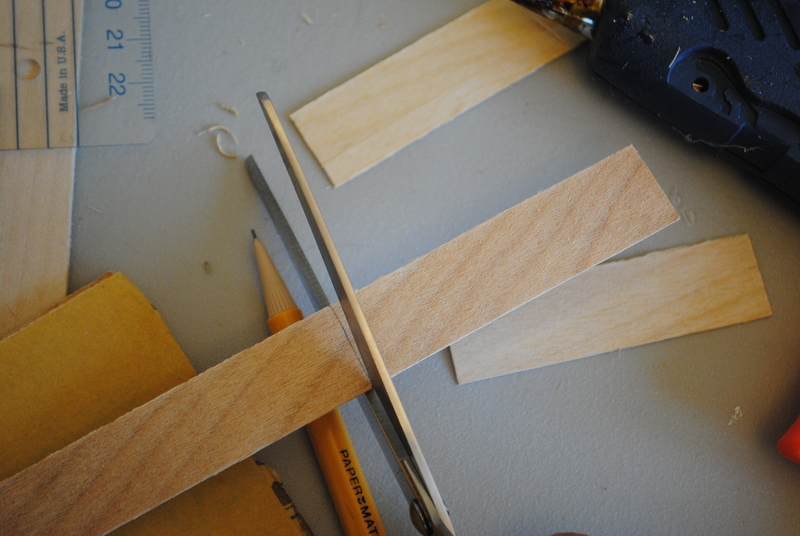 And by the way, I saved the discarded end pieces in case I need a filler piece later. One final time to see if everything fit properly before I glued it down. 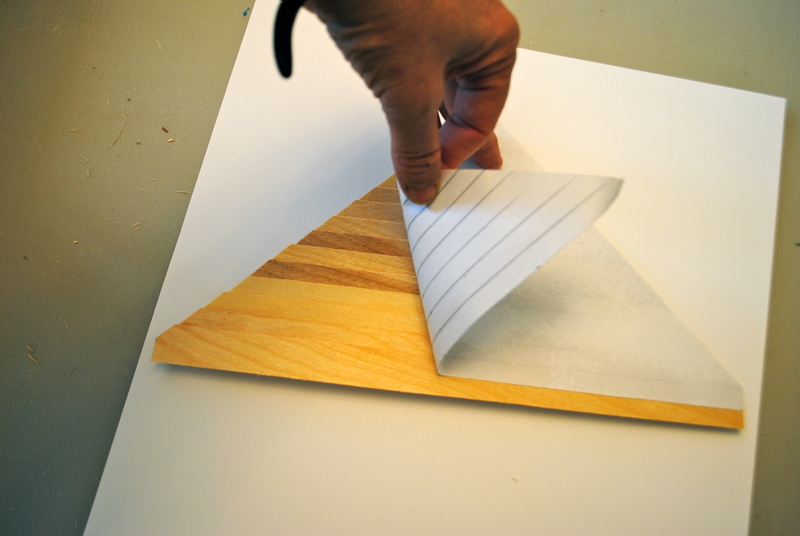 Laying the template wood side down I began to carefully peel away the paper. 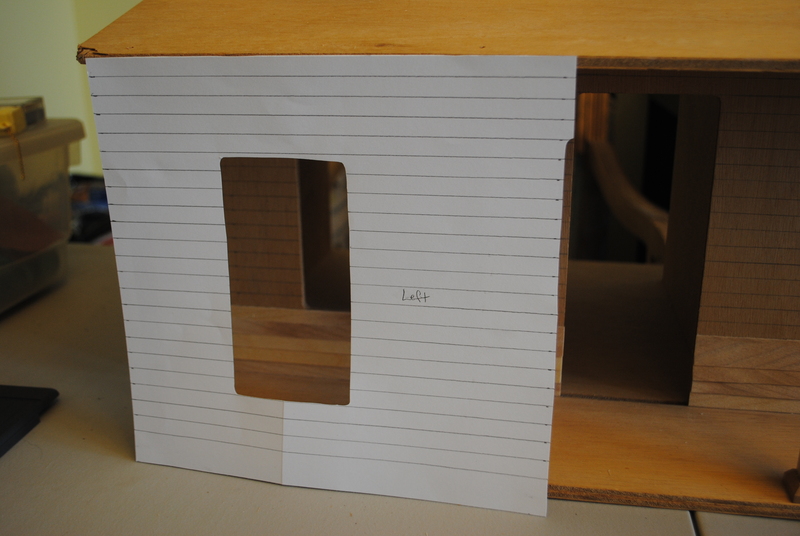 One place I read online said to glue the paper directly to the dollhouse, but I was afraid it wouldn’t adhere well. My method is a bit more labor intensive, but I think it will hold better. 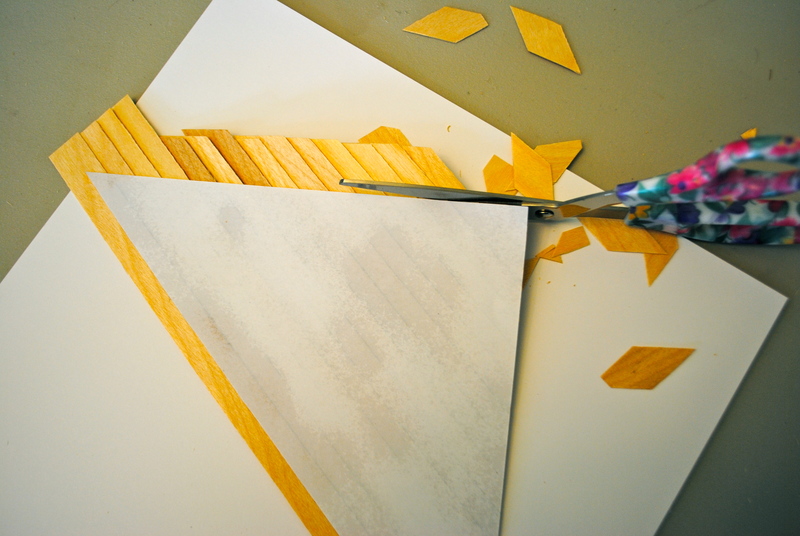 I continued to hold down the wood strips as I peeled the rest of the paper template away. Note that the strips will be a bit tacky still from the spray-on adhesive. I’m missing a step in the photos here, so you’ll just have to take my word for it! 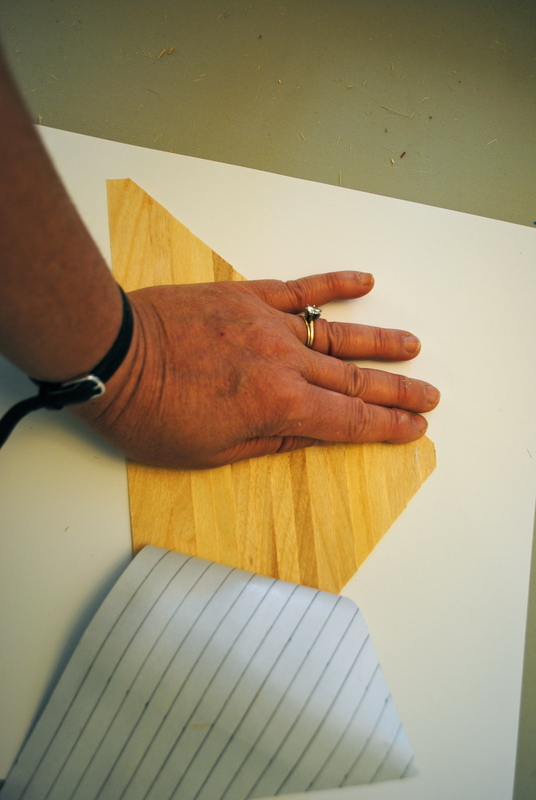 Holding the template-shaped section of wood strips very carefully, I flipped it over wood side up. The strips separated a bit, but stayed in order. That’s what’s important! 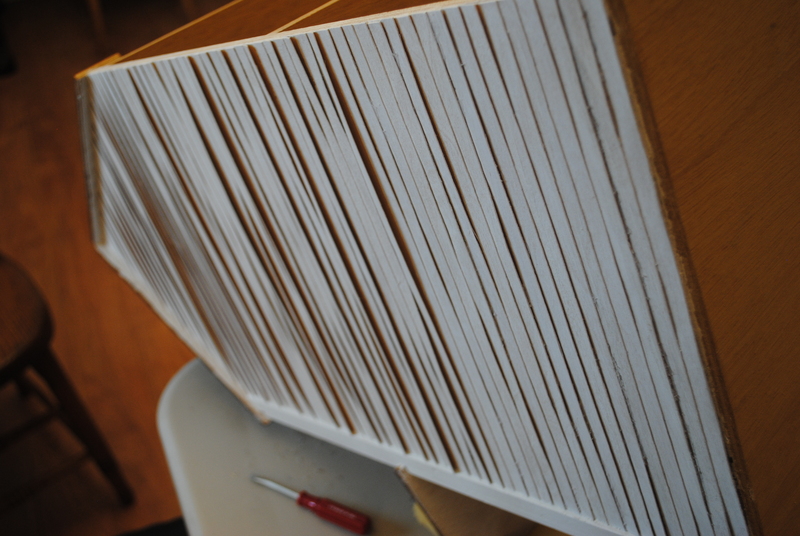 One by one, I hot-glued each one down exactly like the rest of the siding had been done. 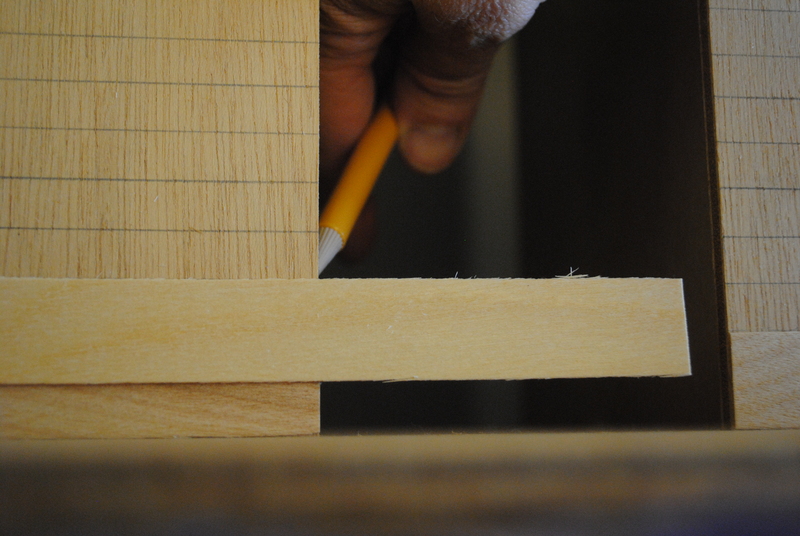 This one little piece was still sticking out, so I used my fine-pointed pencil to draw a line along the edge of the dollhouse on back and then carefully cut it off. 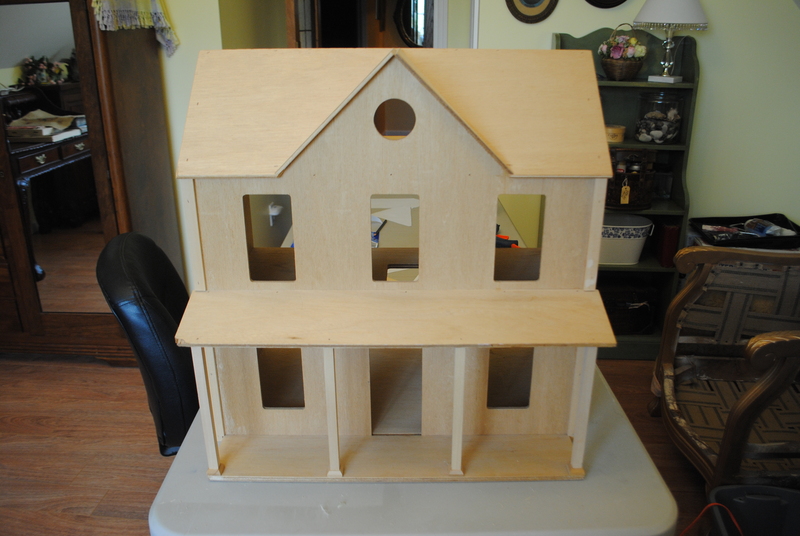 Here’s the finished side of the dollhouse. I have five simple words: The. Power. of. the. Internet. 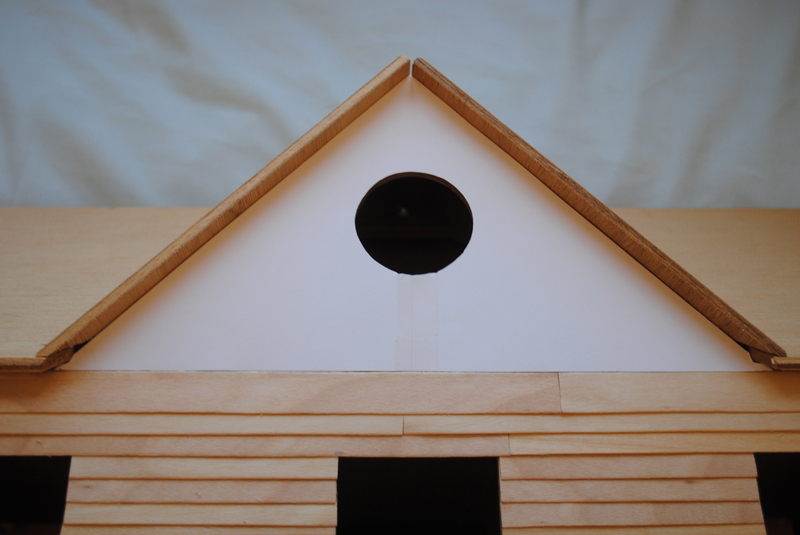 There’s one more gable on the front of the house along with four odd-shaped sections of roof I’ll have to put shingles on, so I’m really thankful that I discovered the idea of using a template. Stay tuned to see how I handled siding the front of the house with five windows, a door, a porch roof and pillars to work around . 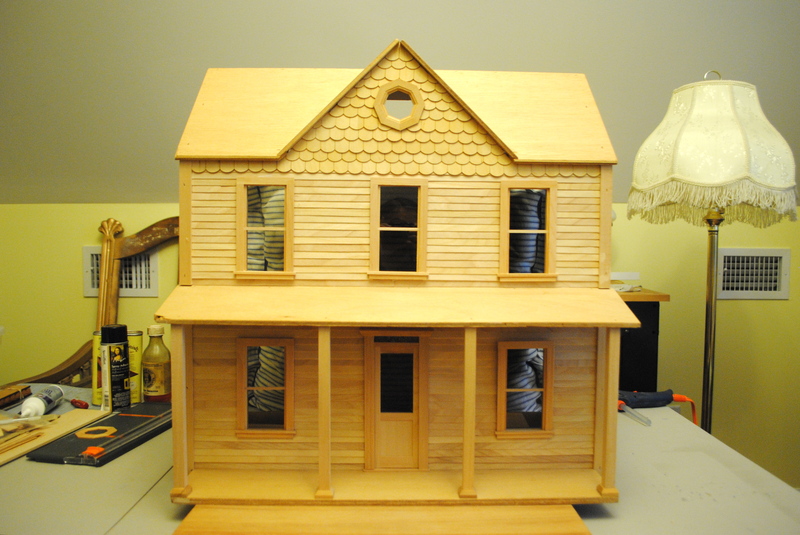 . .
Once I decided to make my dollhouse Victorian, siding became an important factor. Old houses have that beautiful narrow lap-siding. It’s a lot more time-consuming to install, whether your house is full-sized or dollhouse-sized, but it adds so much authenticity if it’s done right! Here’s my old Victorian. The right-hand side is original. The lower left-hand side was a 1980’s addition. 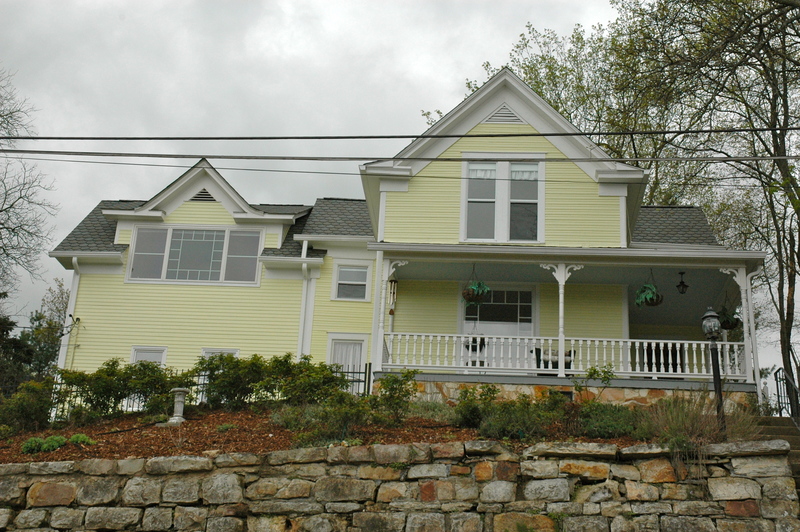 In 2002 we took off that roof and added a second story with a gable that mimicked the original gable right down to the way it curved into the roof and a large picture window that mimicked the original one, half hidden behind the porch. I fought with our contractor for the (more expensive) narrow Hardy-board siding on the addition instead of the cheaper wide version! And when he advised me to rip off the unique, one-of-a-kind original siding, we found a different contractor and had him restore it. This house was indeed a labor of love! 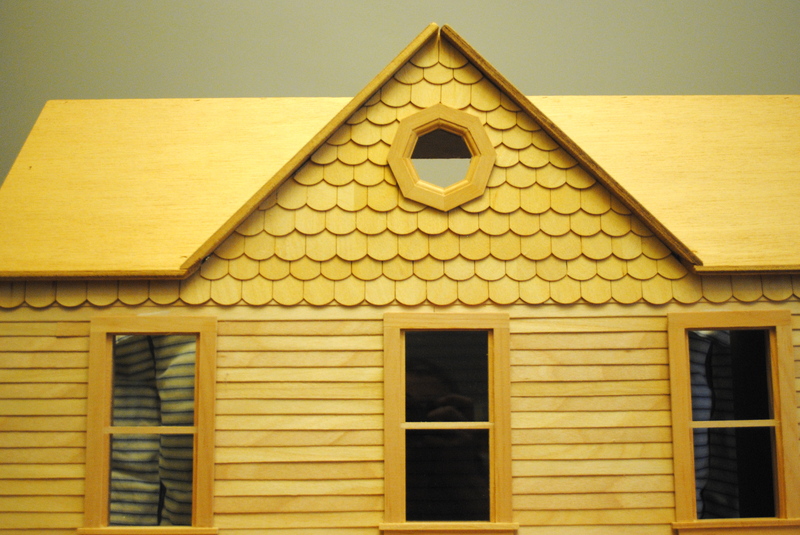 So now that you’ve seen my inspiration, let’s talk dollhouse siding. This is the siding I ordered. 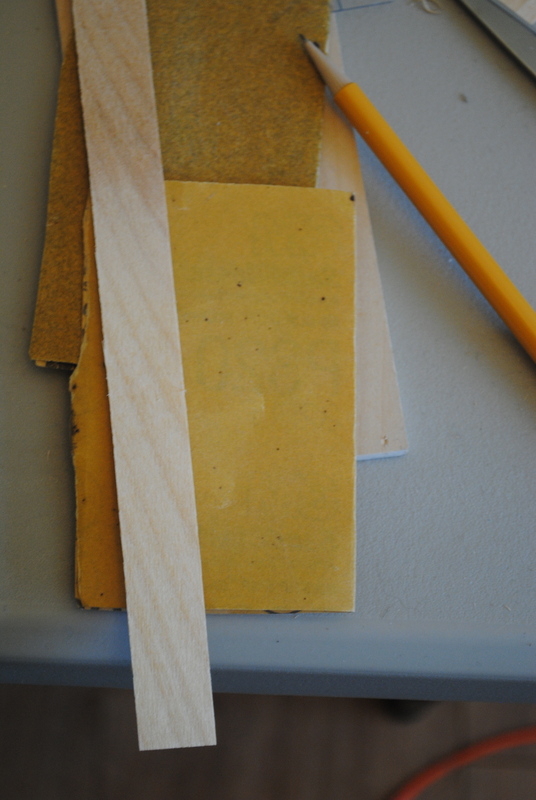 Here are the supplies I used: Siding, a ruler, a fine-pointed pencil, a hot glue gun, a board for measuring and cutting, a scissors, and fine 220 grit sandpaper. 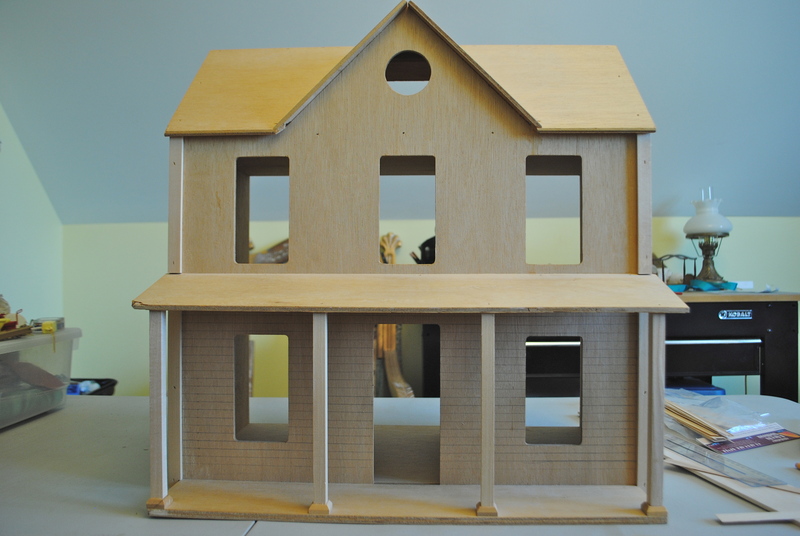 The very first step is to measure the exact width of the dollhouse side. 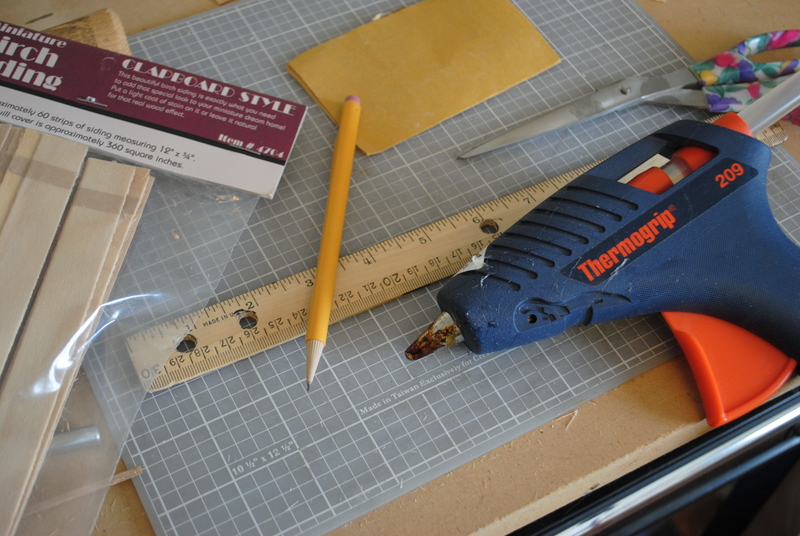 (I like using a wooden ruler because I can pencil a measurement in and use it over and over without remeasuring each strip of wood.) 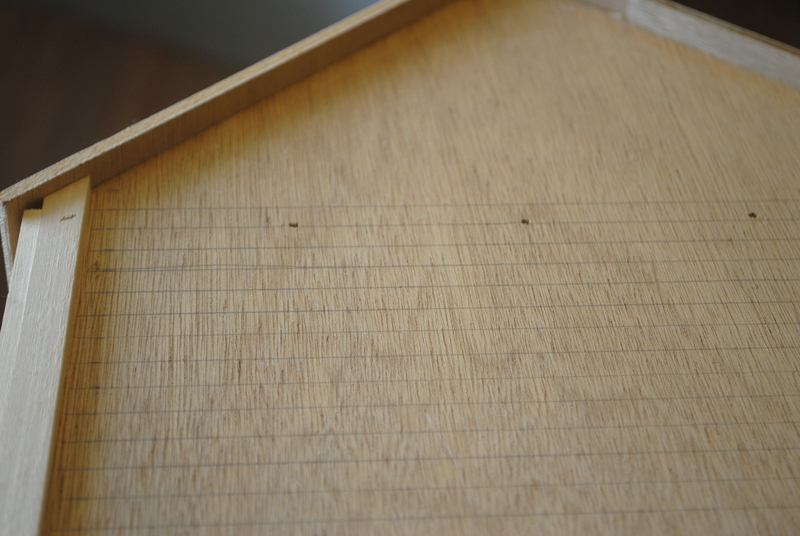 I marked the first strip of wood with a little “tick” mark. 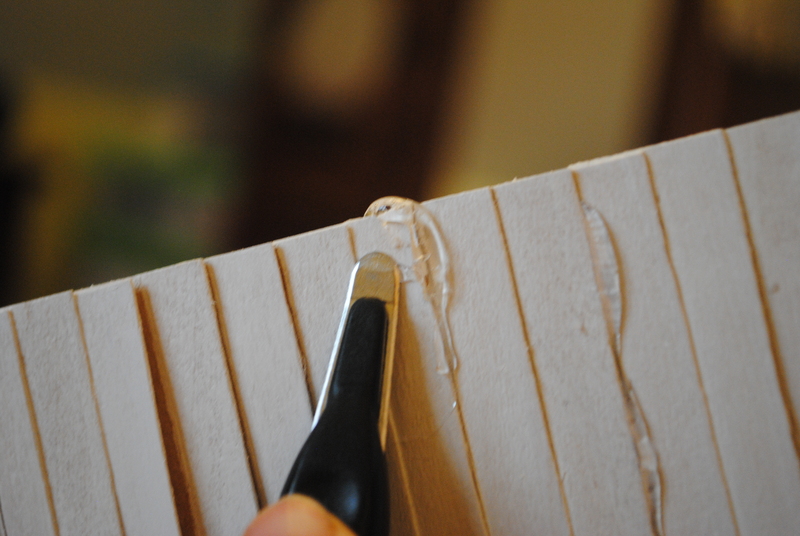 Next I cut off the excess length of the wood strip with a scissors along the “tick” mark. 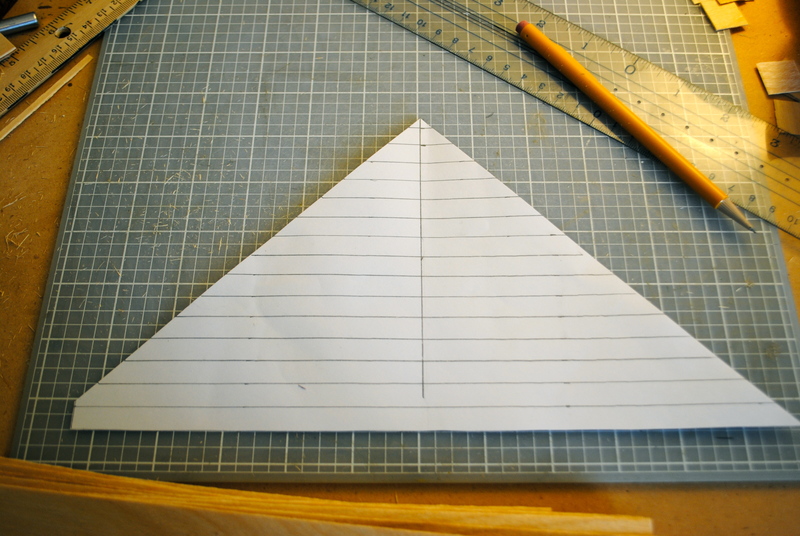 I’m pretty good at eyeballing a straight cut, but if you’re not, you might use a small T-square to draw a line, ensuring that your cut will be straight. 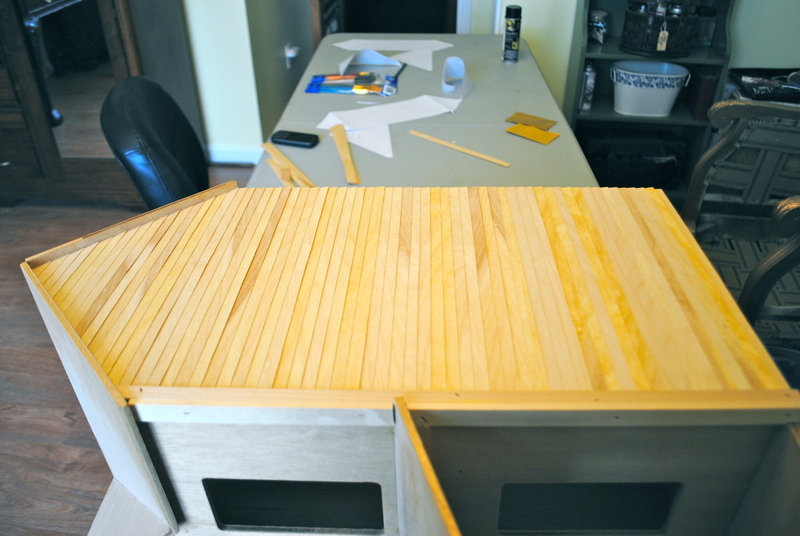 I plan to edge the open (back) side of each wall, so any slight imperfections will be hidden, anyway. 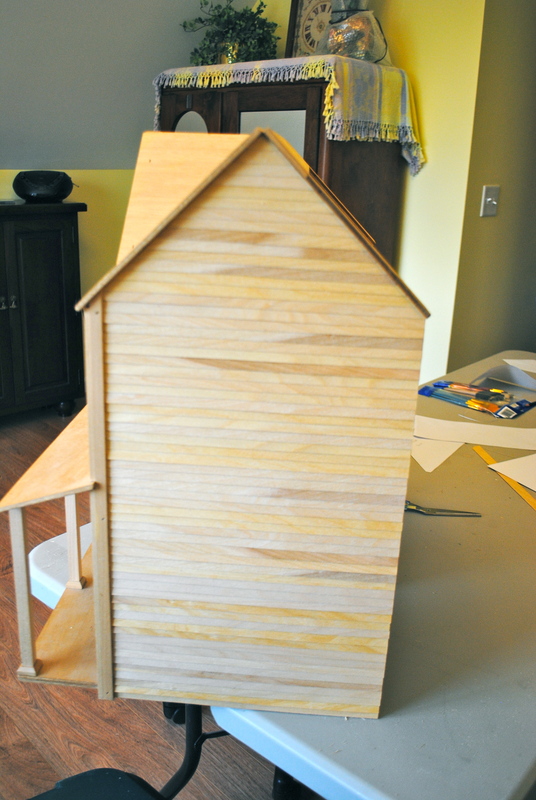 The next step is to draw lines on the side of the dollhouse to be sure the siding goes on straight. 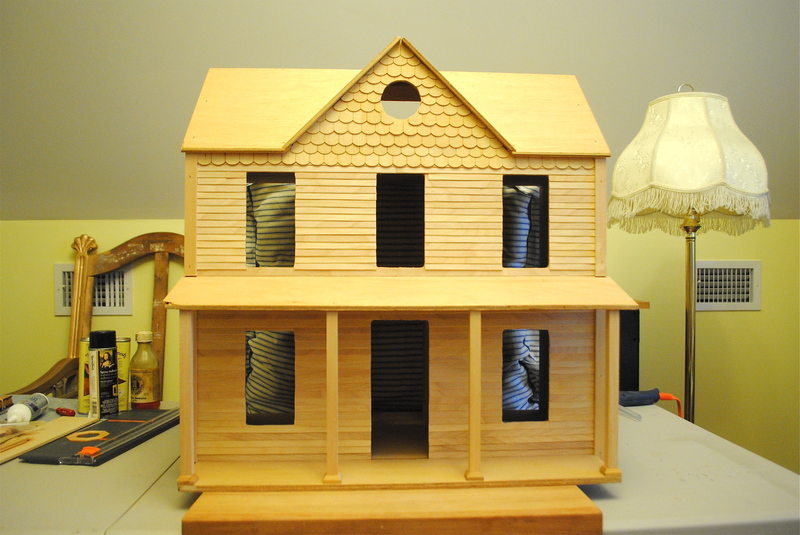 I hot-glued my first siding strip across the bottom of the dollhouse. 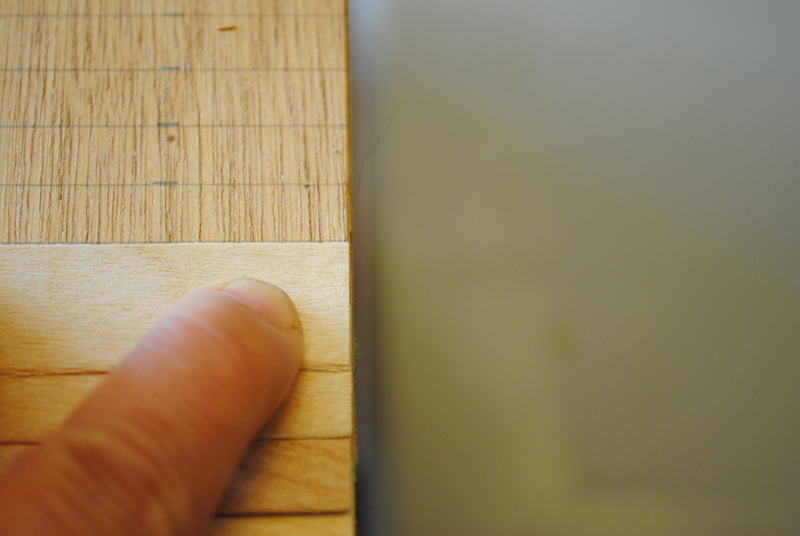 I measured the strip vertically (height) and halved that amount. 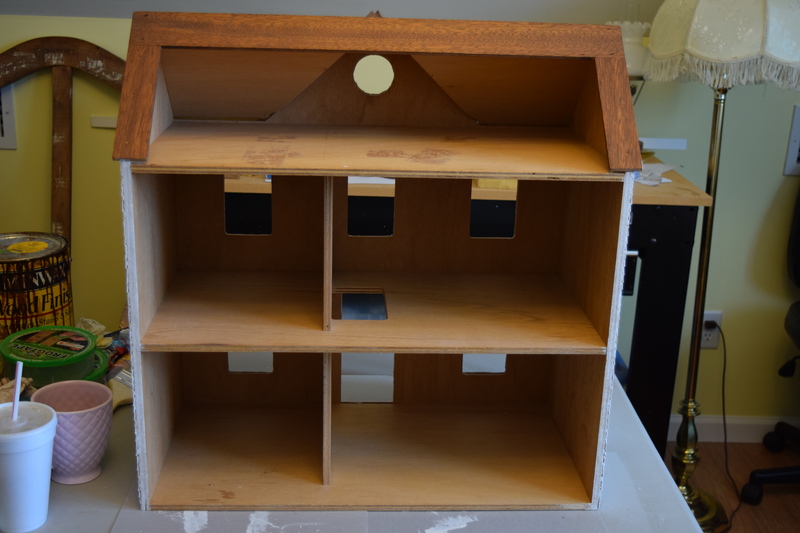 Using that halved measurement, I ruled lines all the way up the side of the dollhouse, starting at the top edge of the first strip. 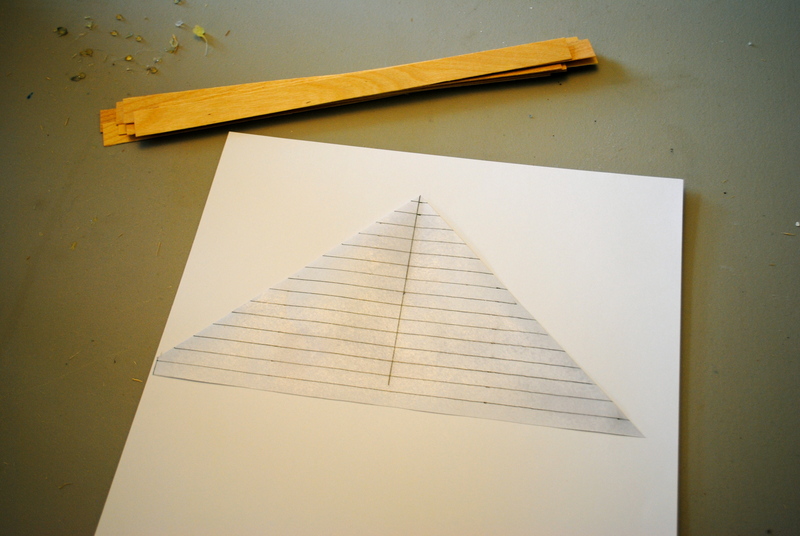 It works best to measure all the way up one edge and then all the way up the other edge, then draw straight lines across. 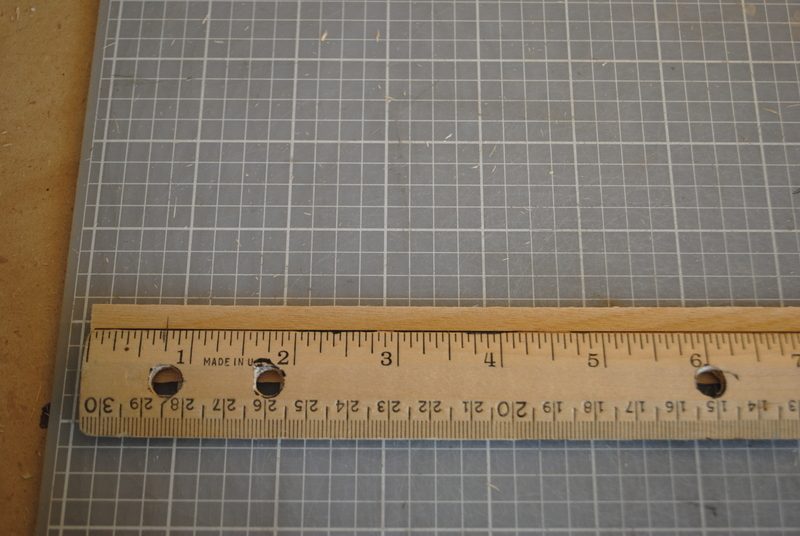 Depending on the size of your dollhouse, you may need a longer straight-edge for this than a 12-inch ruler, as I did. 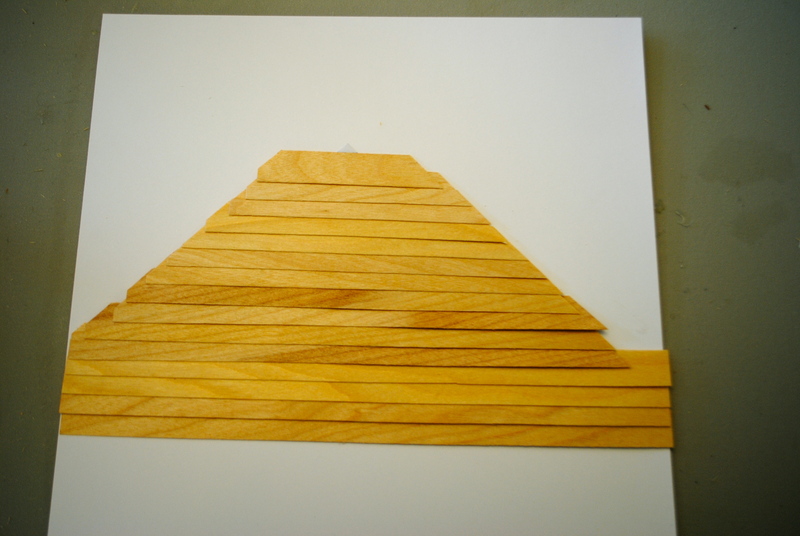 These lines, shown above, serve to line up each successive strip evenly so that it covers half of the strip below it and gives a nice, even appearance to the siding. Like this! 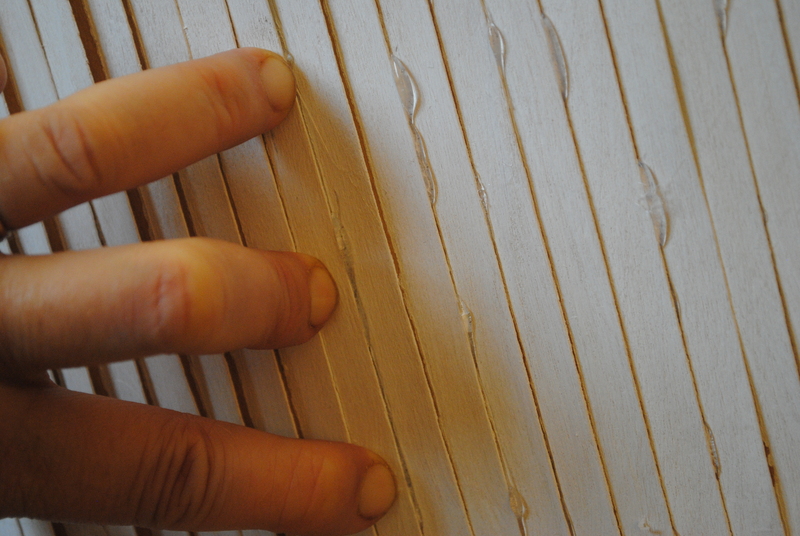 One thing I did was to sand gently along one edge of each strip after I cut it to the correct length. 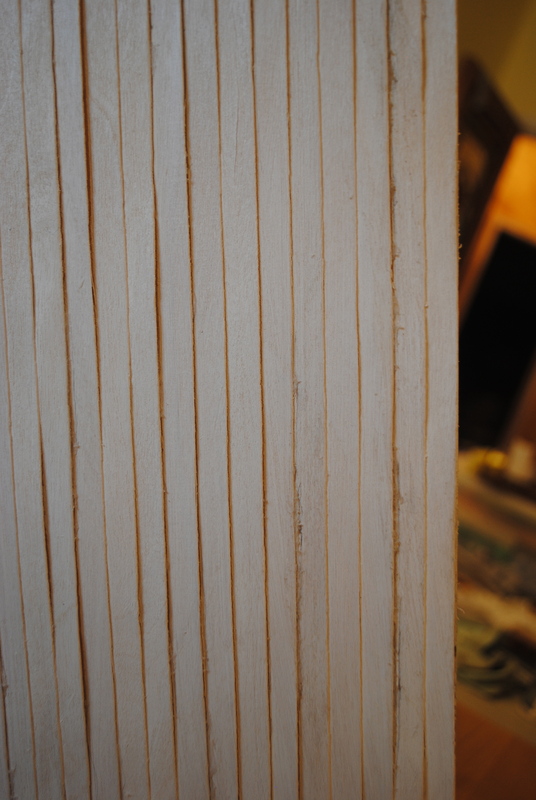 If you look at the first photo of the siding package, you will see shreds of wood on the work surface. A lot of these cling to the siding strips, and gently sanding the edge that will be visible makes the final product look better. 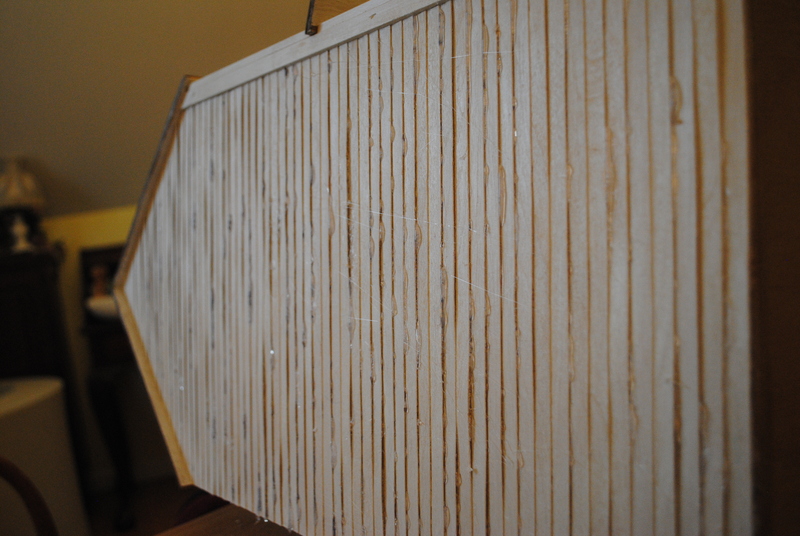 Starting at one end of the un-sanded side of each strip, I applied a string of hot glue. 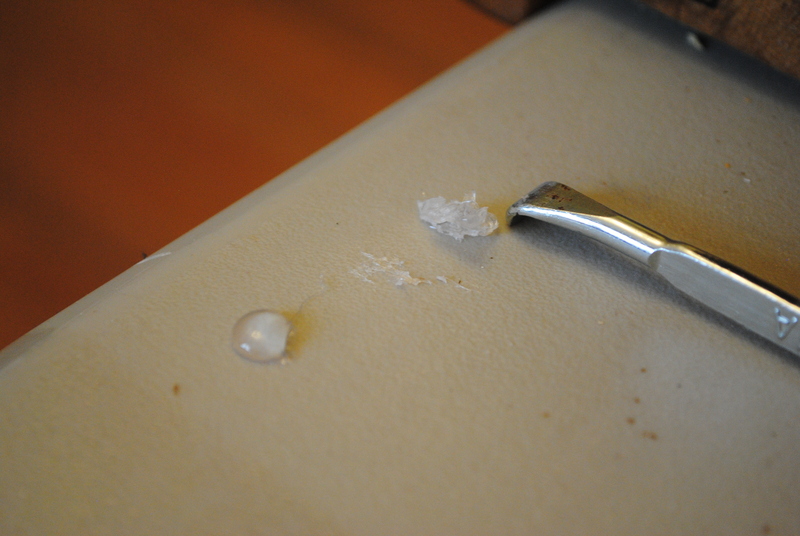 Hot glue sets quickly, so I took this picture FAST to show how much glue I used. As you can see, my hand is not the steadiest, but it doesn’t matter. Speed is more important. 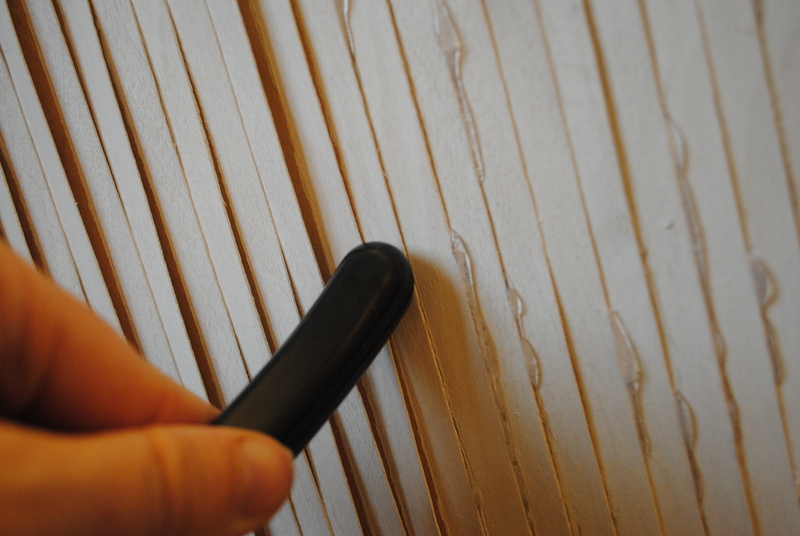 Then each strip got pressed into place using both hands (except when I needed one hand to take this photo). 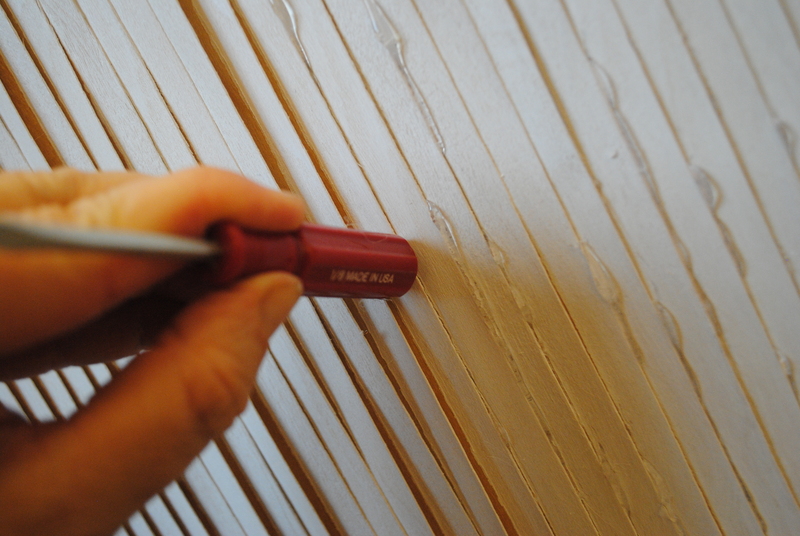 It’s important to place each strip accurately, using your pencilled lines, and then to press it quickly in place for good adhesion. 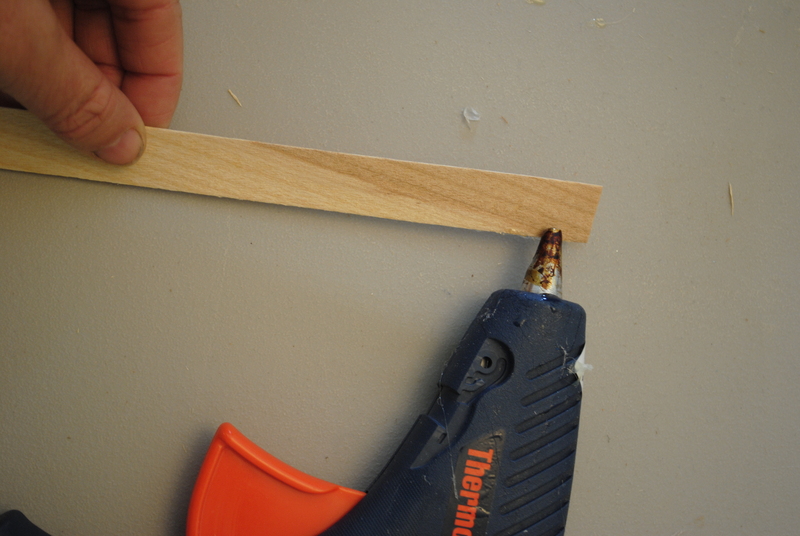 Hot glue does not tolerate sliding a strip into place! Once again, here’s the look you’re going for. 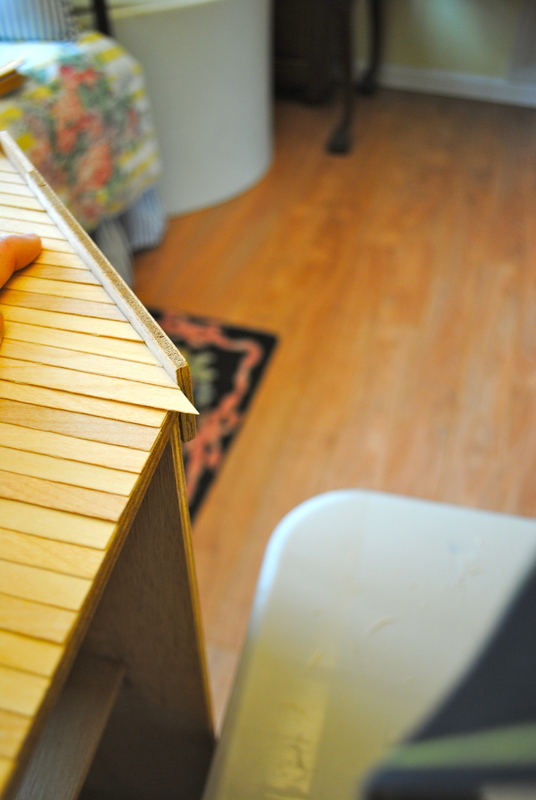 Occasionally I got the glue started on a strip of siding and realized I had forgotten to cut it down to size first. No problem! Once it was glued down, I just cut it off carefully, even with the others. You want this back edge to be as even as possible, although I intend to trim it for durability. 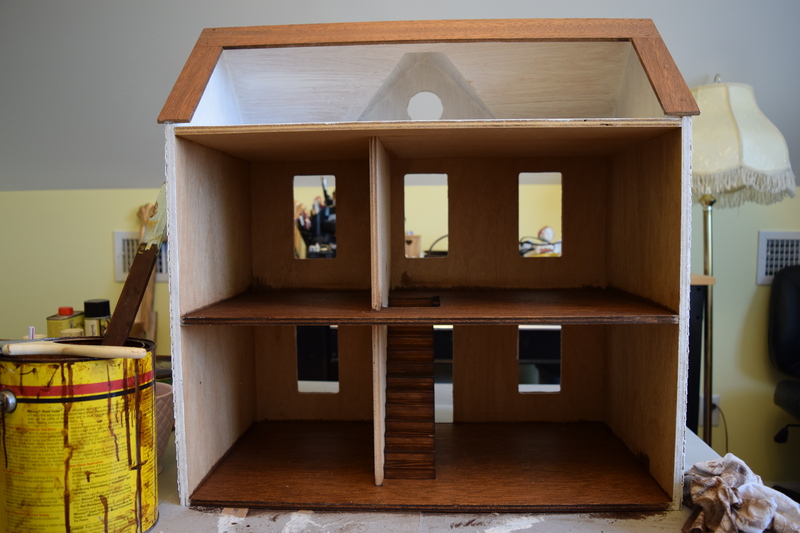 Since this dollhouse will actually be played with by children, I don’t want to risk the edges of the lap siding getting caught and pulled loose or broken off. As you can see, the front edge of my siding against the existing trim is less than perfect. I think by the time I put on a coat of primer and a coat of paint, everything will look just fine. 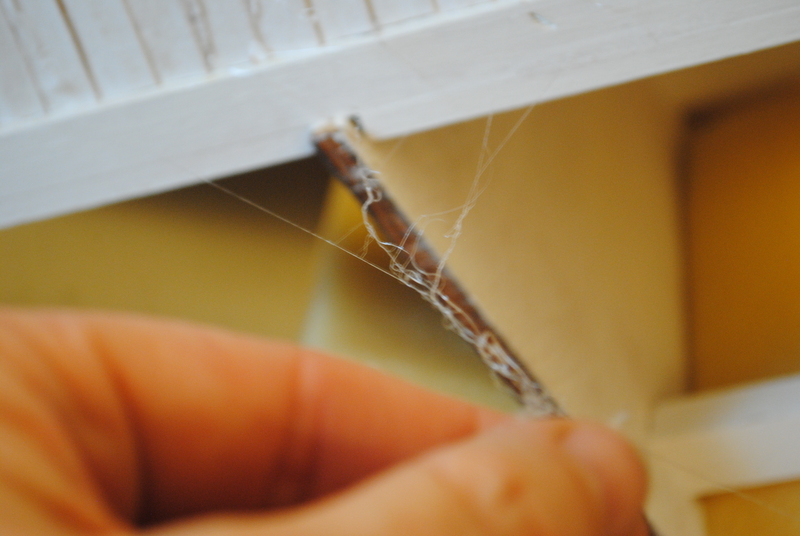 Occasionally a bit of hot glue extrudes beyond the top edge of the siding. While this will be hidden by the next layer of siding, it can also leave a bulge under the next layer. 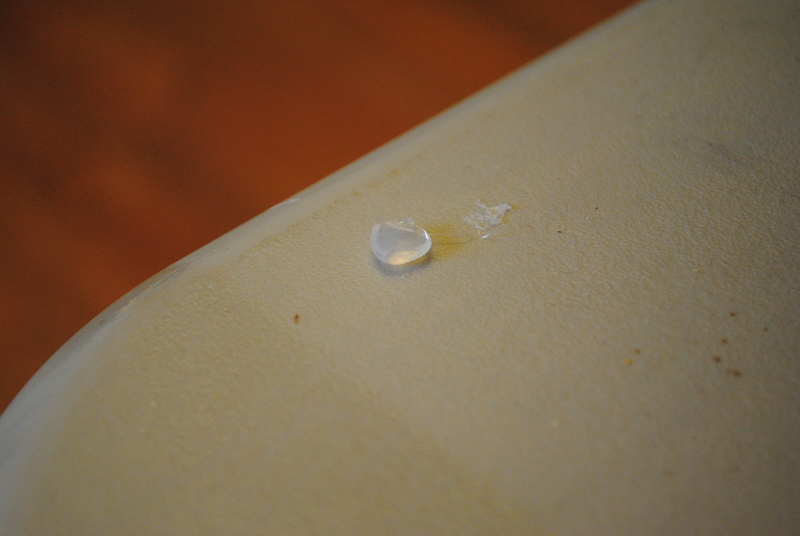 So, once the glue has cooled, I use a fingernail to scrape off the excess blob of glue. 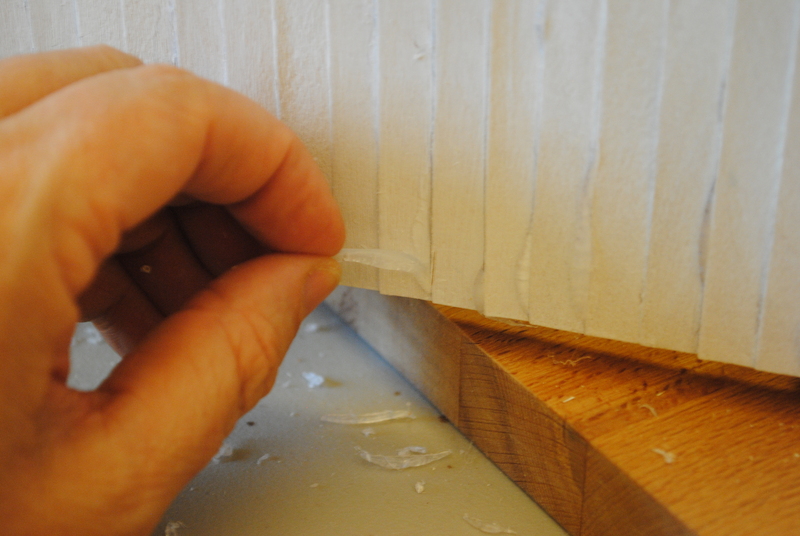 An exacto knife is more likely to slip and cut the siding, which is why I do it this way. Eventually, you will get to this point on your siding. Hmmm, how to tackle that? I did some research on the internet (how did we ever get anything accomplished pre-Google?) and came up with a simple (not fool-proof, though, as I found out to my chagrin!) solution. Stay tuned . 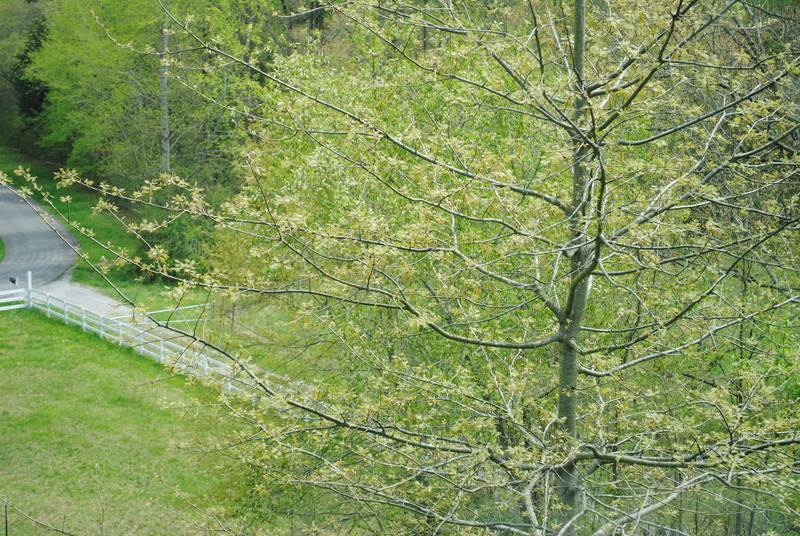 . .
Back in April when this view of tender foliage was outside the window of Spare Oom, I started on a new construction project in Narnia. Then life got in the way, and construction ground to a halt. Now that working inside to avoid the suffocating heat of summer seems like a brilliant idea, I thought it was time to take my construction project public. Maybe that will keep me at it! “WHAAAAT?” you might well ask. “Didn’t you just finish creating Narnia in your attic? What could you possibly be building now?” Well, here’s the answer to that very good question . . .
I’m building a house! 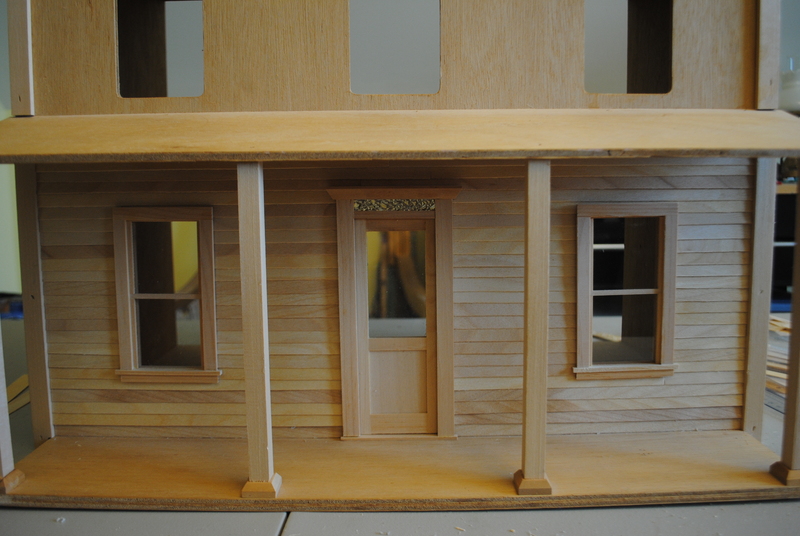 A dollhouse, yes, but a house! This time I’m the general contractor, builder and decorator! I bought this house before we moved to France in 1990, and it sat in storage with our furniture until we came back to the States in 2001. At the time I thought I would decorate it in French style. But it sat . . . and sat . . . and sat . . . in a closet. Then in 2008, two things happened. 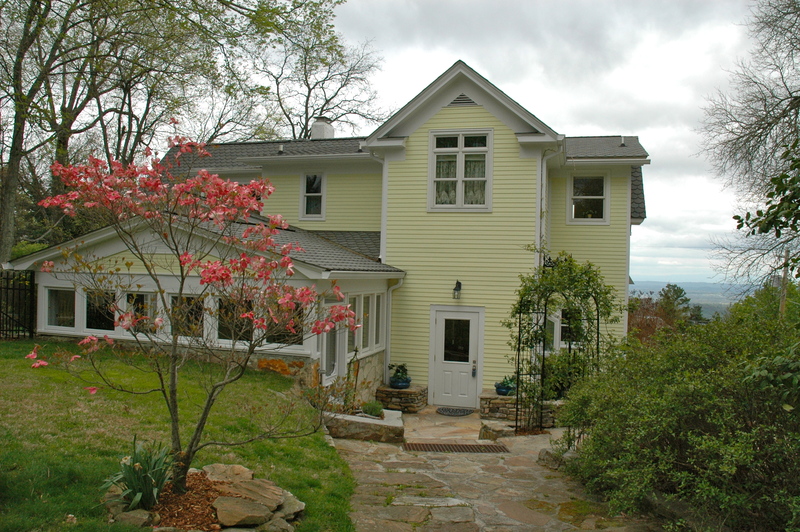 1) We left my beloved Victorian house in Tennessee and moved out here to the country. It was my idea to move, but oh, was it hard to leave my dream house! 2) Our first grandchild, a girl, was born. Now at last I had a really good reason to pull out the dollhouse and get to work. But of course the work of turning this place into a farm took precedence, and somehow the dollhouse languished again. 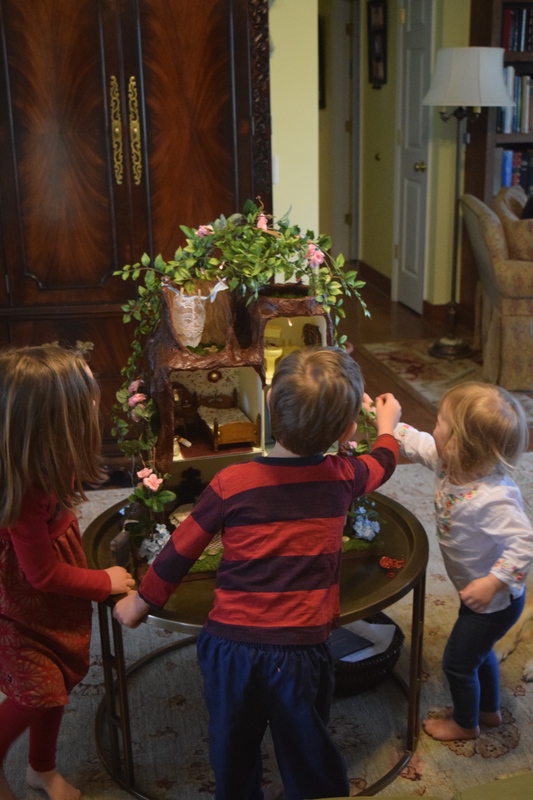 Then earlier this year during the process of furnishing Narnia, Charis (now 4 1/2) saw the dollhouse and was enchanted. That was all it took! I realized that the idea of making a French house no longer seemed so appealing. Instead, I would rather recreate my beloved old Victorian. 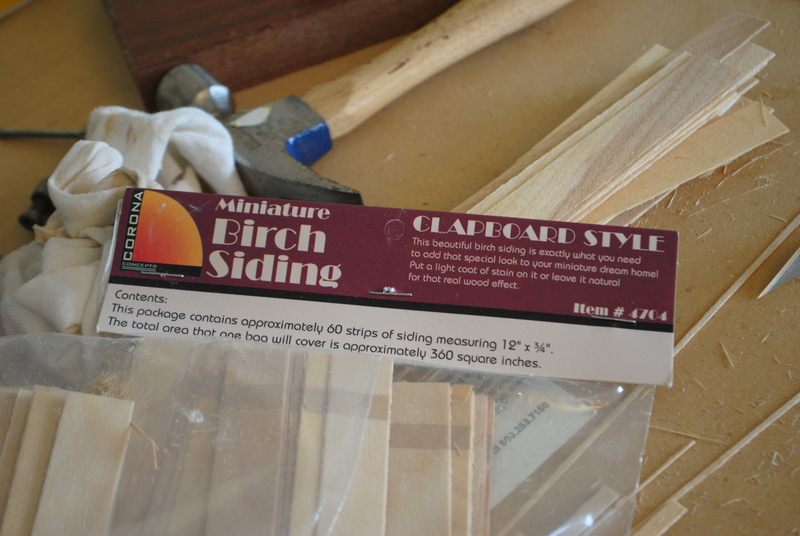 So I ordered lap siding and set everything up to begin construction–again! So this is an invitation to join me up in Narnia while I build a house-within-a-fantasy-land-within-a-house. And when I’m done with this, there’s an old Lionel train waiting for its own world to come to life in the basement. So there’s plenty of magic still left in Narnia, just waiting to be breathed into life! For Narnia . . . and the South? Interdisciplinary Artist:: reflective, radiant, relational.